5/21/06 Set up the wing stand. When you live in a log home, you gotta keep the design constant. (It also helps to have leftover logs). 5/31/06 Finally arranged a visit from my EAA Tech Counselor, Kyle. He inspected my construction technique for the empennage and deemed it is "acceptable". 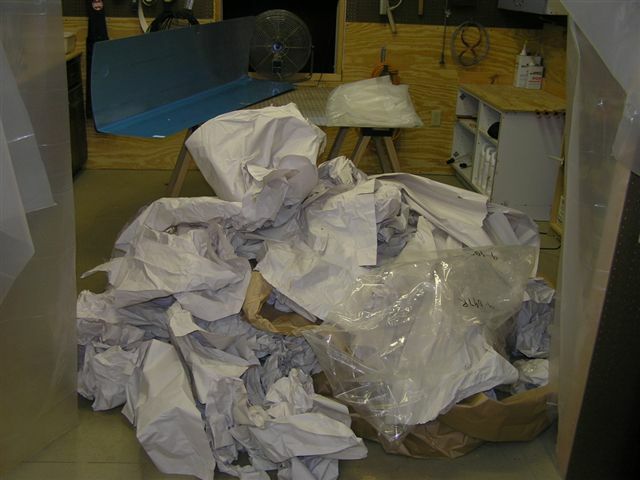 While he admitted the work was awesome, he noted that the FAA prefers more sterile language...so "acceptable" it is! I also got notification from Vans that my slow-build wings will ship on or before July 10th! Today I also ordered a quart of alodine from ACS as well as another gallon of Sanchem. 7/21/06 Finished the inventory. 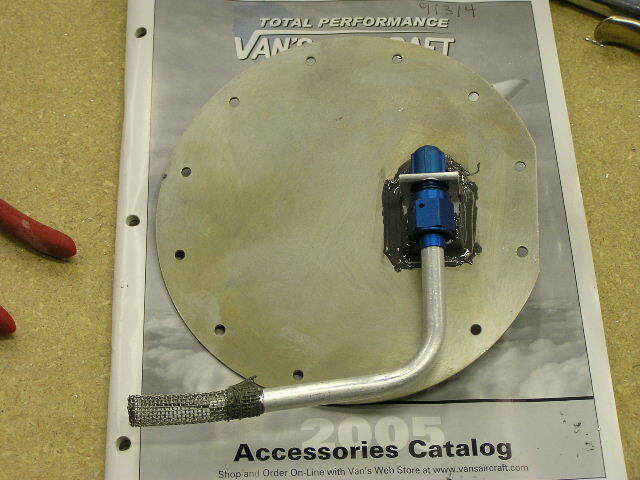 I only had one, two-inch piece of 1"x1" aluminum angle missing from the kit...Guess I'll call Vans's on Monday. I got everything organized and had a lot of trash to haul out. 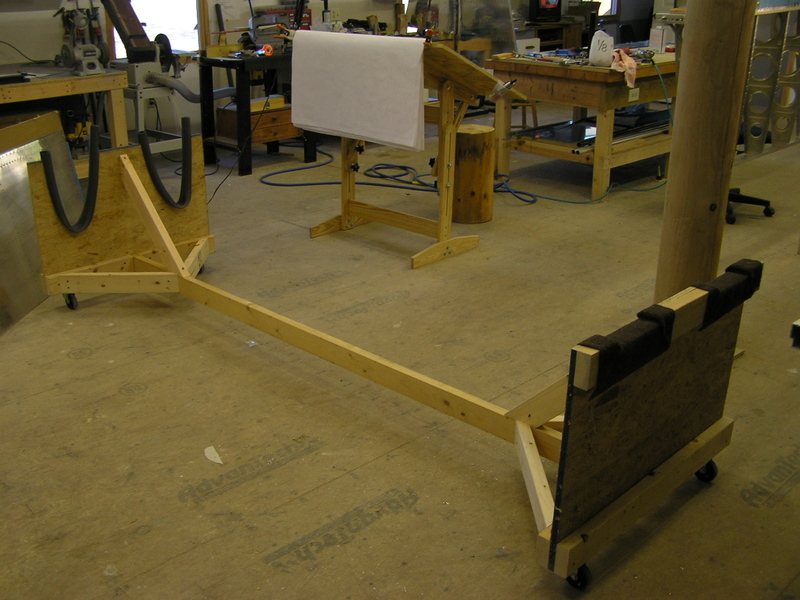 7/22/06 Today I started by setting up the right wing on the stand and clamped it down. I plan to build the right wing first, and then the left. 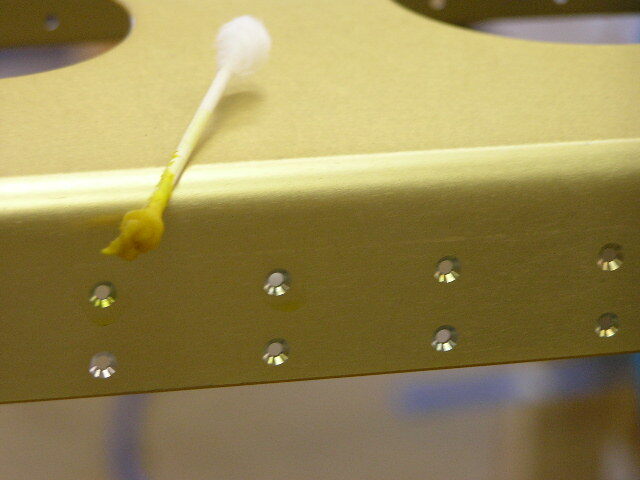 I drilled the spar to #40 for the 124 platenut rivets. 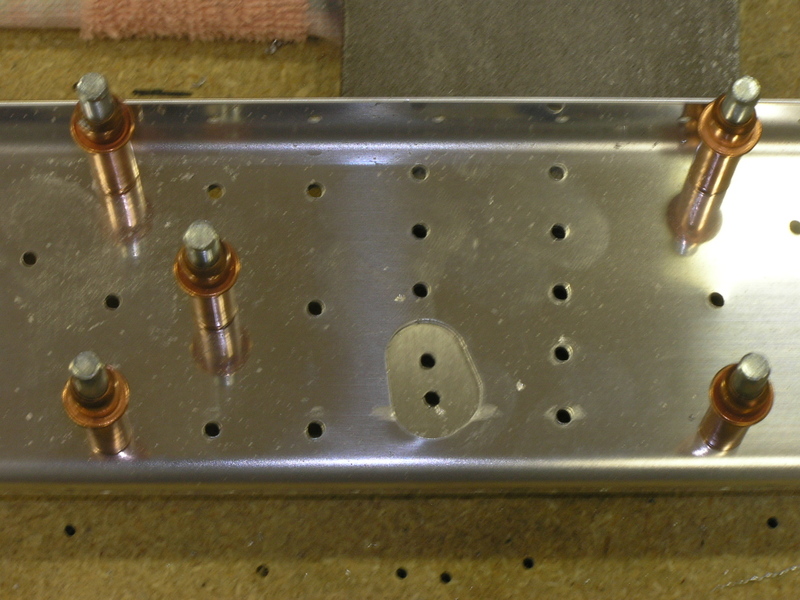 Then I countersunk the rivets and deburred the back of each hole. I then dabbed the countersinks with Alodine using a Q-tip. 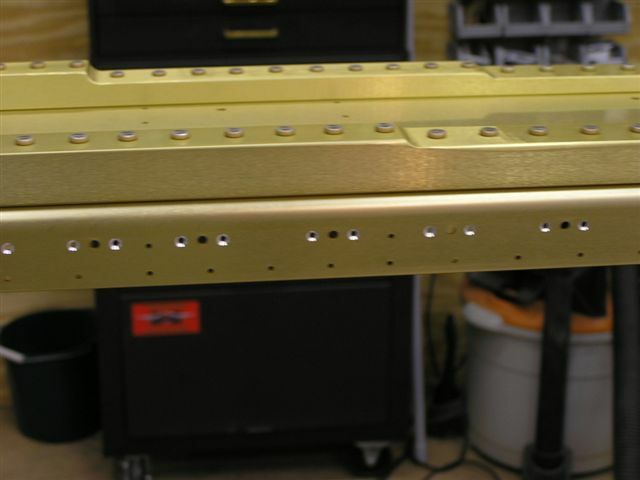 I began riveting the #8 platenuts. 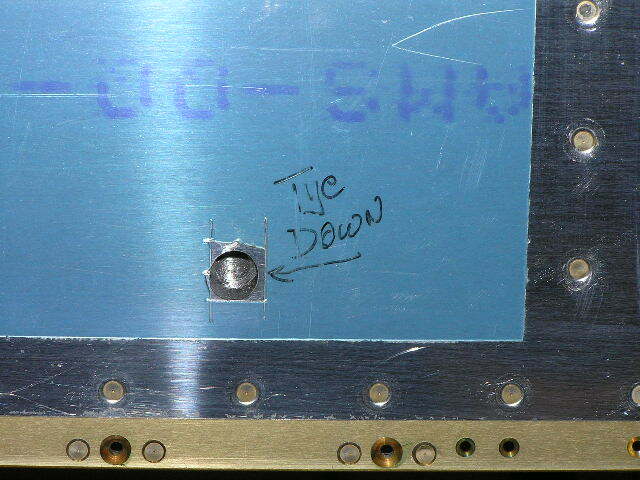 I also tested countersinking the platenut for the #8 screw. (Thanks to Mike Schipper and Smitty for their tip on going slow with the cutter in order to keep a nice countersink) I also cut off a #8 screw and used it to gauge the countersink depth. 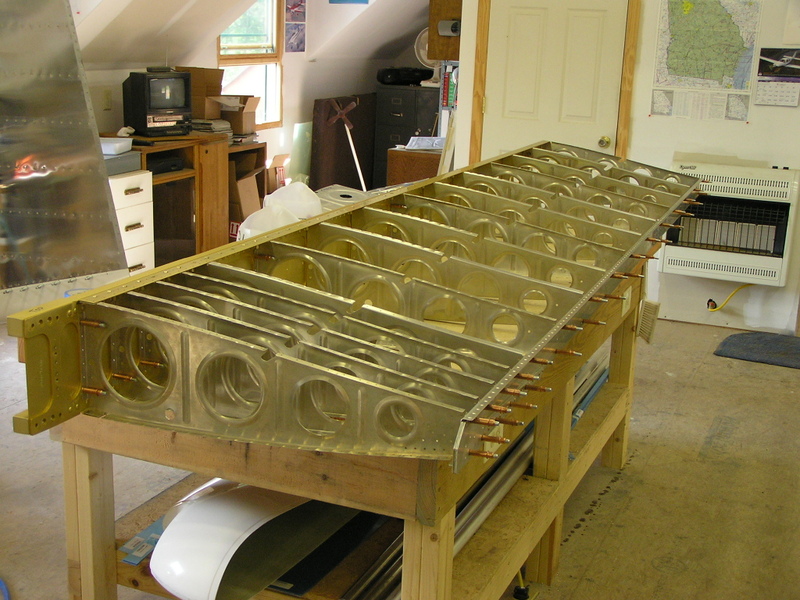 7/23/06 Finished countersinking the spar for the #8 screws...all 62 of them. 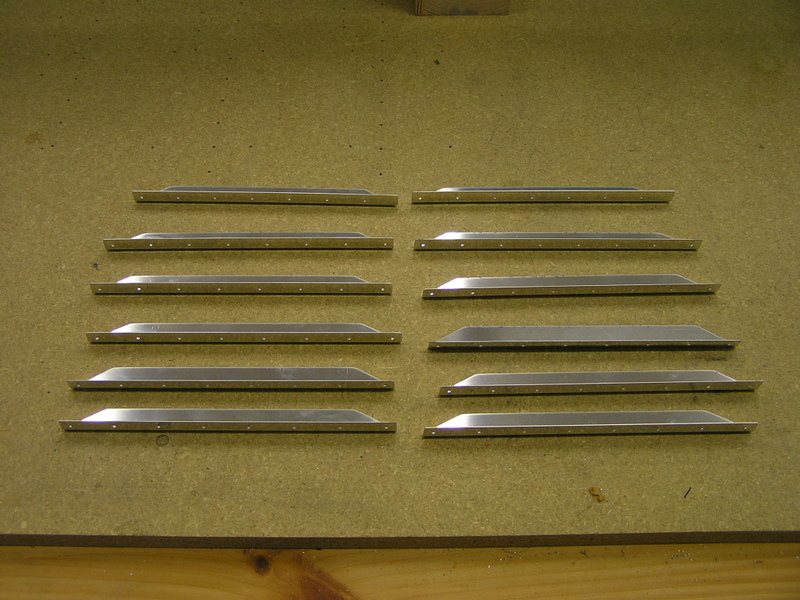 Alodined each countersink. 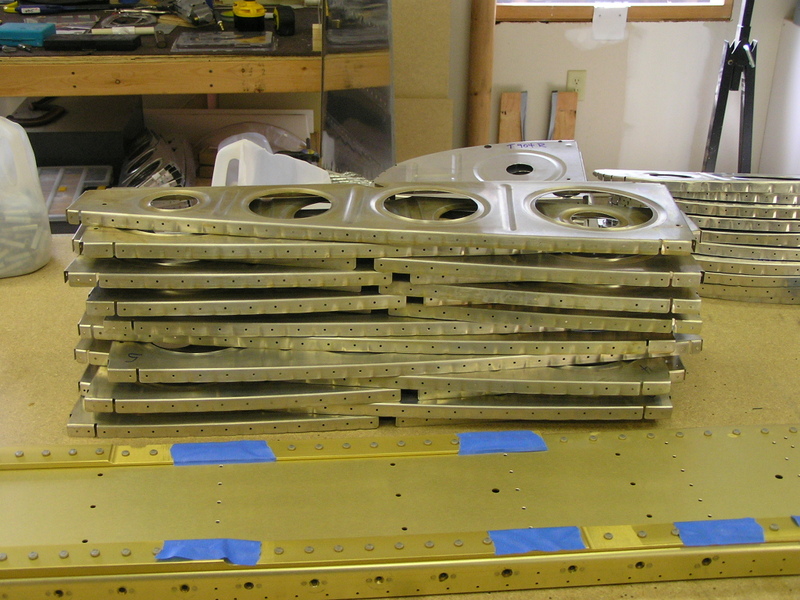 I edge deburred the access plates. 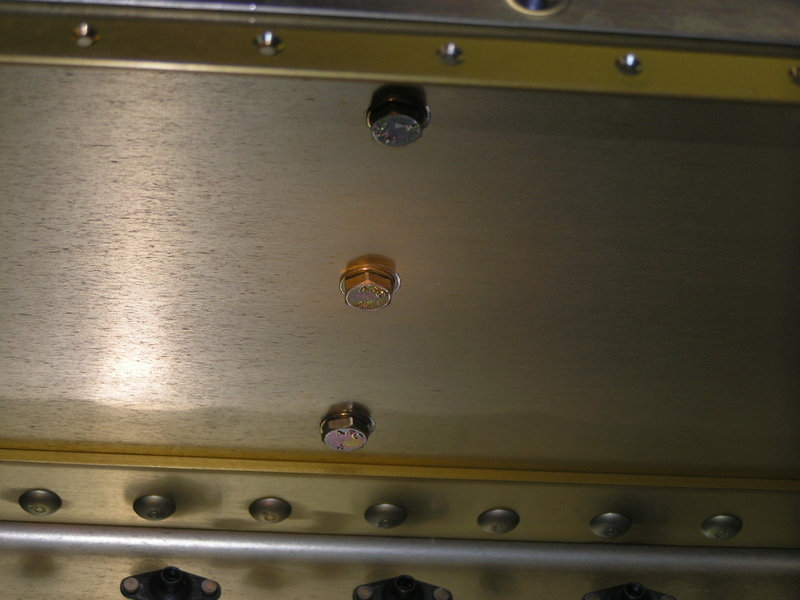 I countersunk the spar to install the #6 platenuts for the access plates. 7/24/06 Riveted the nutplates for the access plates and countersunk the screws. 7/25/06 Alodined the access plate screw holes. 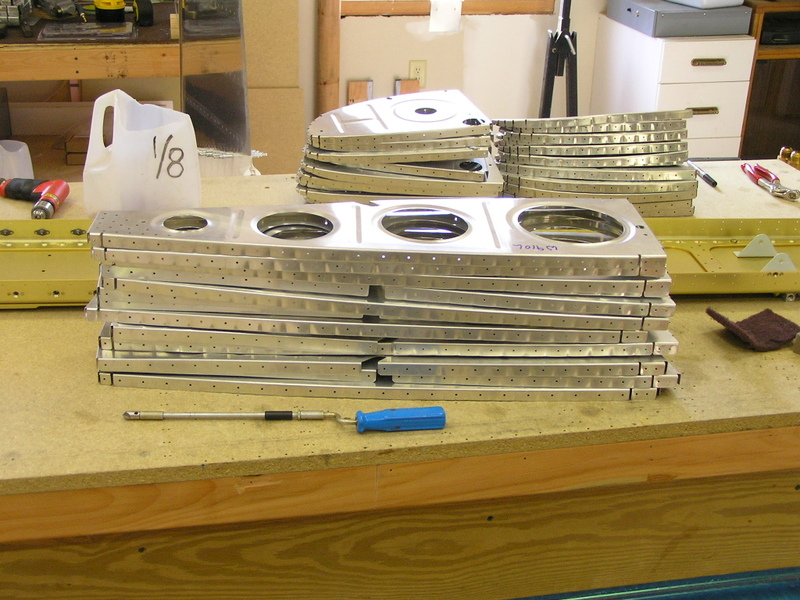 Drilled, deburred and dimpled the #8 holes on all six access plates. 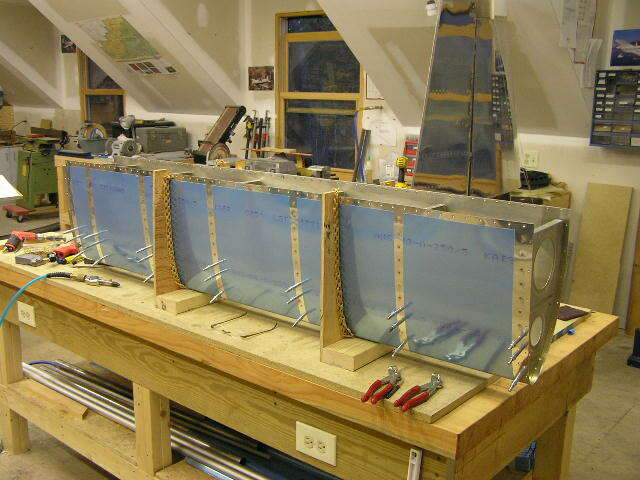 7/28/06 Today I received my delrin rudder stop made by Jeff Bordelon in Austin, TX. 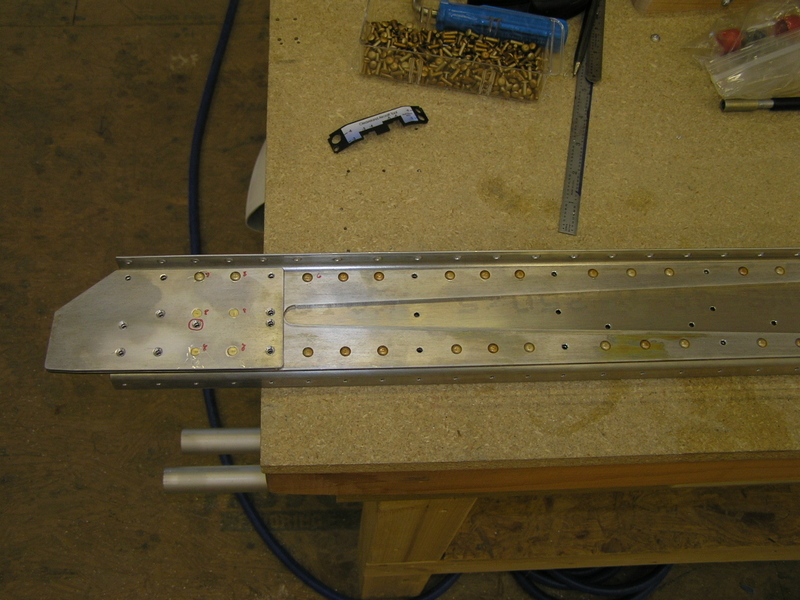 Drilled and riveted the two center section platenuts on the spar. 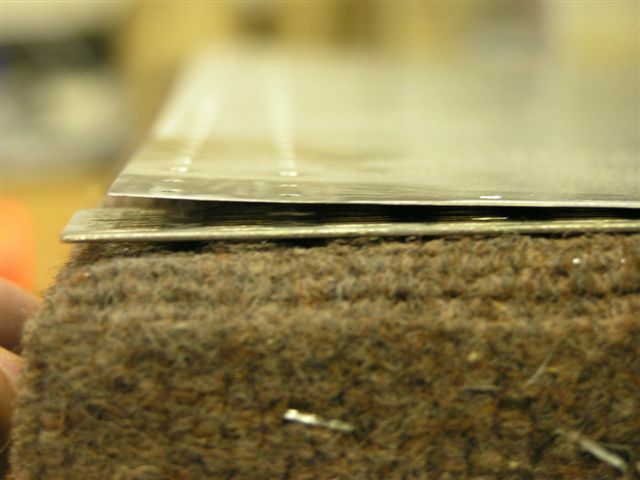 Cut the tie-down bars (both) to length and deburred. 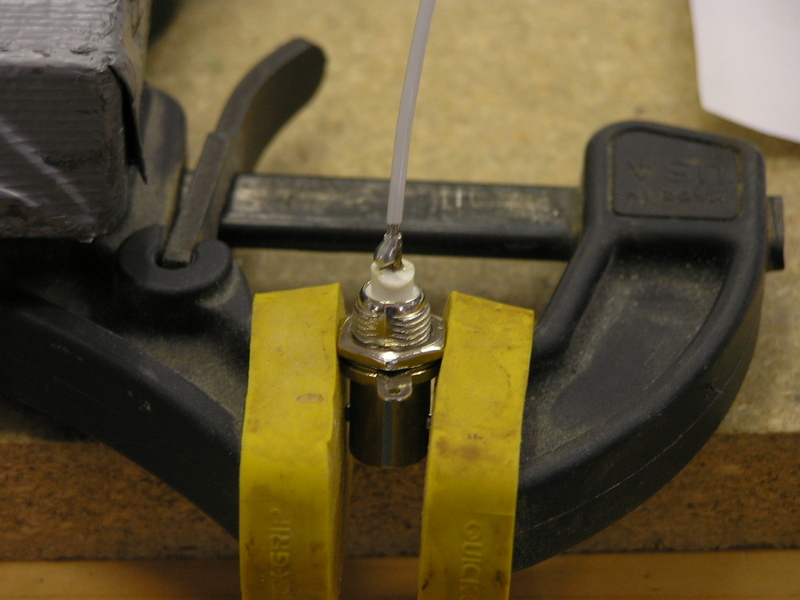 I realized my tap was the wrong thread so I will need to pick up the correct one before I can tap the ring hole. 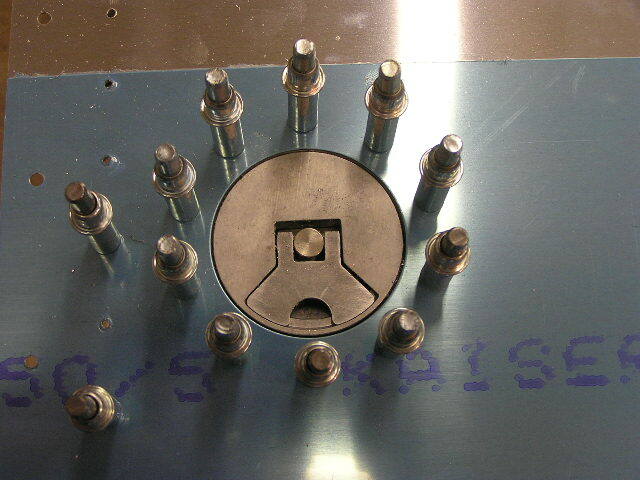 I went ahead and drilled the four attach holes as well as the four platenuts. 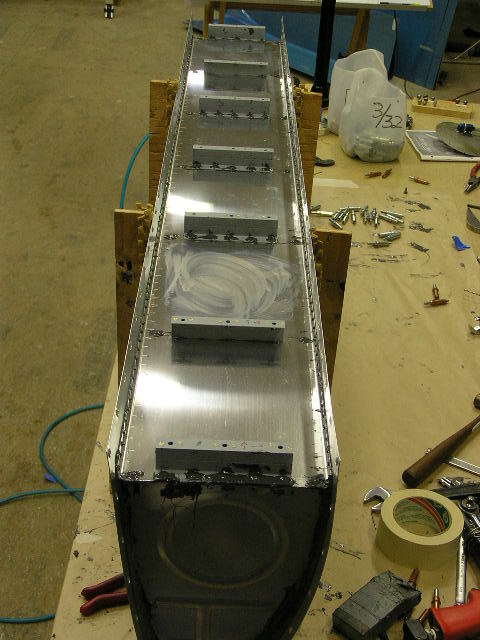 Attached the four platenuts and primed using the rattle can. 7/29/06 Began working on the Rt. 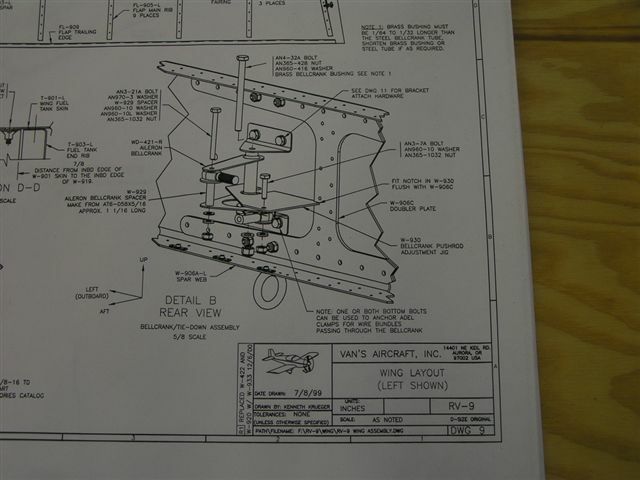 wing rear spar. 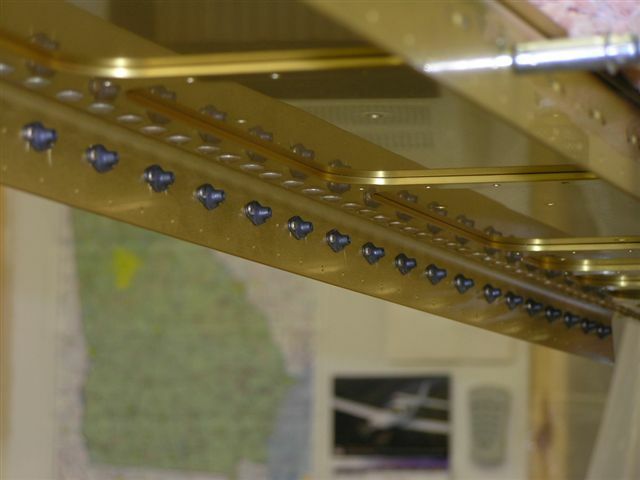 Drilled and clecoed the W-907D and W-907E doubler plates to the spar. Drilled the hole for the aileron pushrod using my Unibit then cleaned it up with a sanding drum in my Dremel tool. 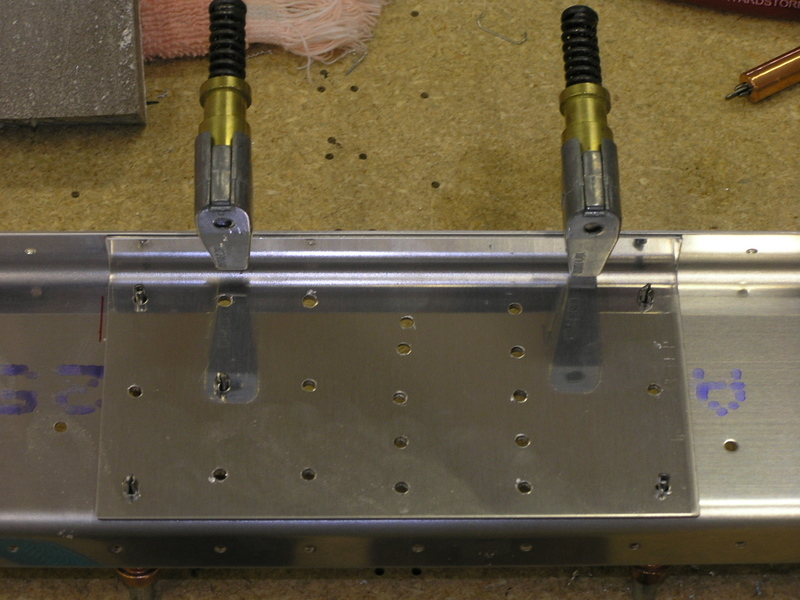 Took the whole assembly apart and deburred the spar and doubler plates. I will be using the SanChem chemical conversion on this plane for all internal spars, ribs and skins. I am using SEM self-etching primer in a rattle-can for small parts as well. I have a full description on this product and how it compares with alodine in the Empennage section of the website. 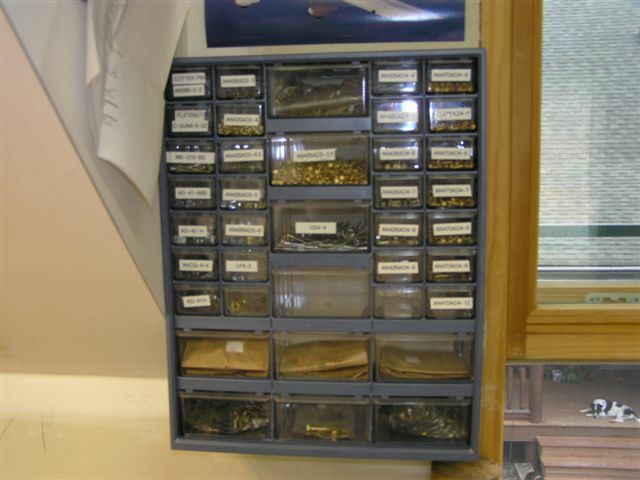 I SanChemed the rear spar and doubler plates. 7/30/06 Dimpled the top holes to accept the skins. 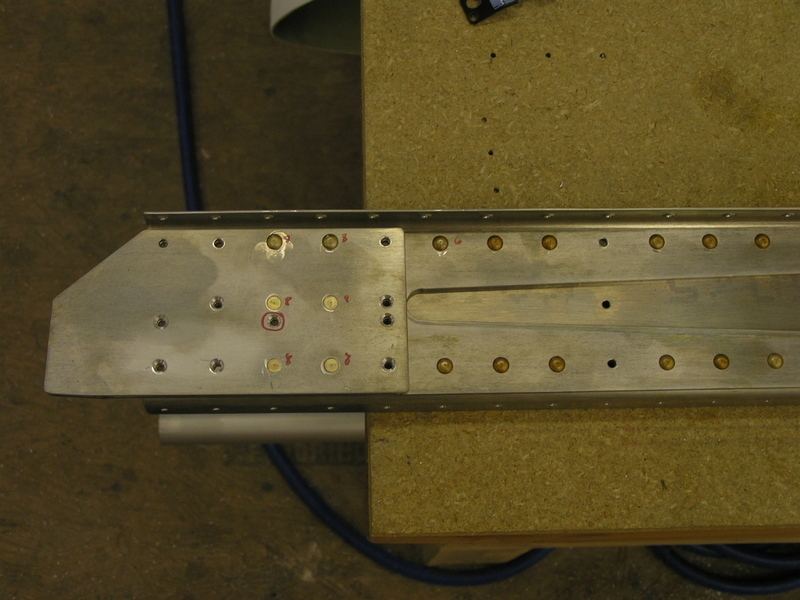 Riveted the doubler plates to the rear spar. 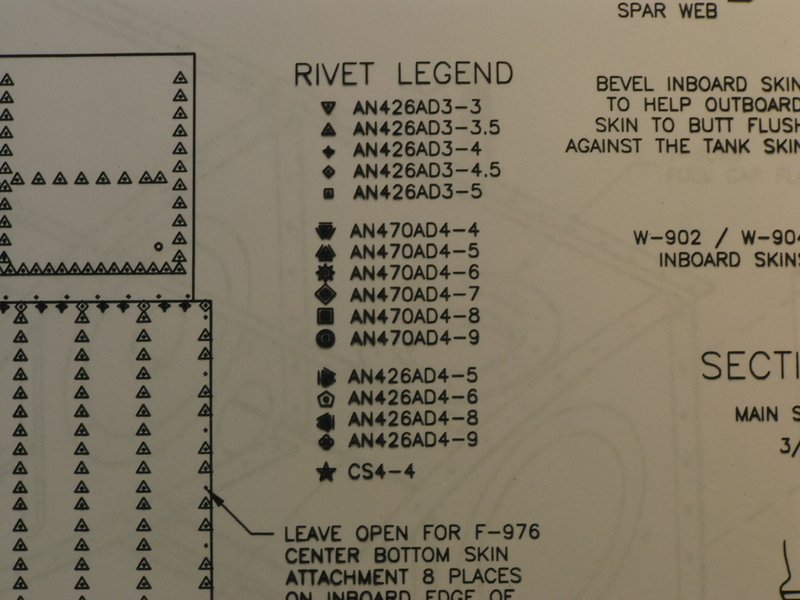 A problem I had was the Dwg 11 plan sheet was a "blotched" print. I called Vans and they are sending me a clean copy. 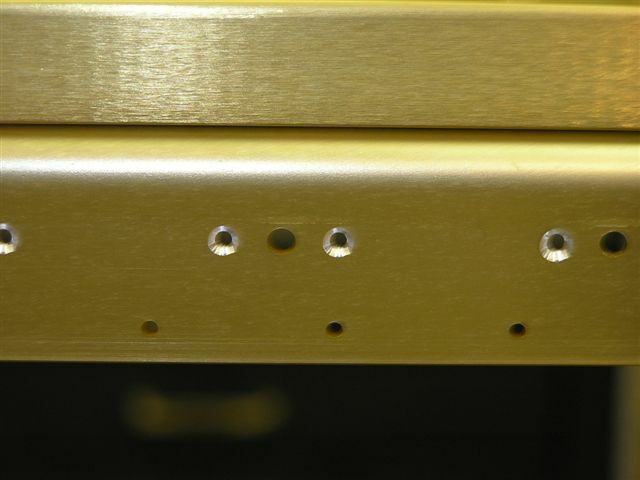 Saved myself some time and just referenced Smitty's website to determine which holes received rivets and which should not. 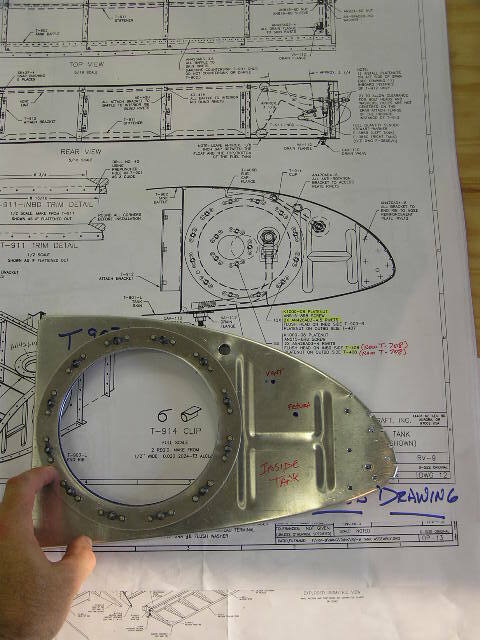 Yeah, I know, that's really cheating....But go back and look at the plans again and YOU try to determine what size rivets (and where) they go. 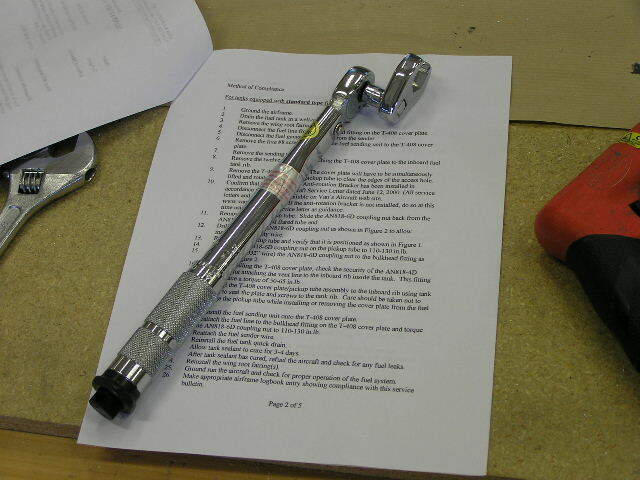 You will notice I deviated from where the plans say to countersink the 3 holes at the spar end. 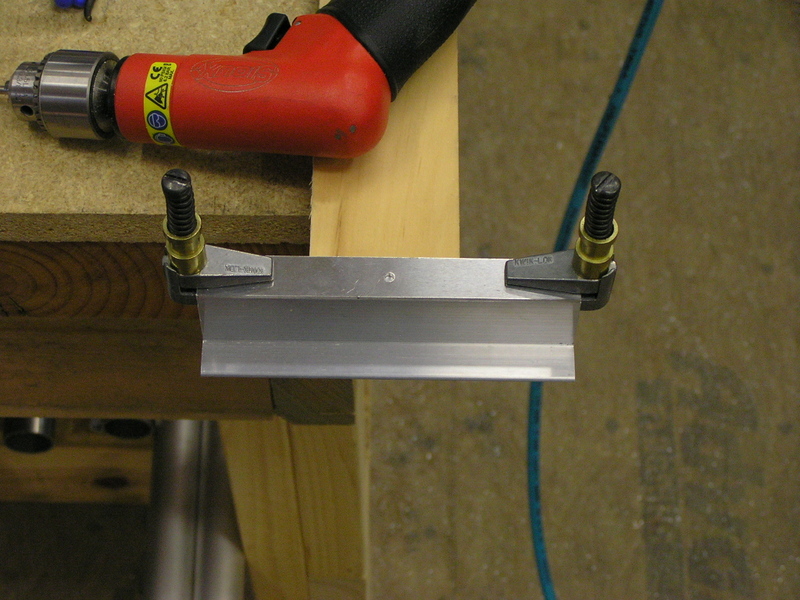 The doubler plate is too thin to countersink so I countersunk the spar and dimpled the doubler plate. Hope Van doesn't care. 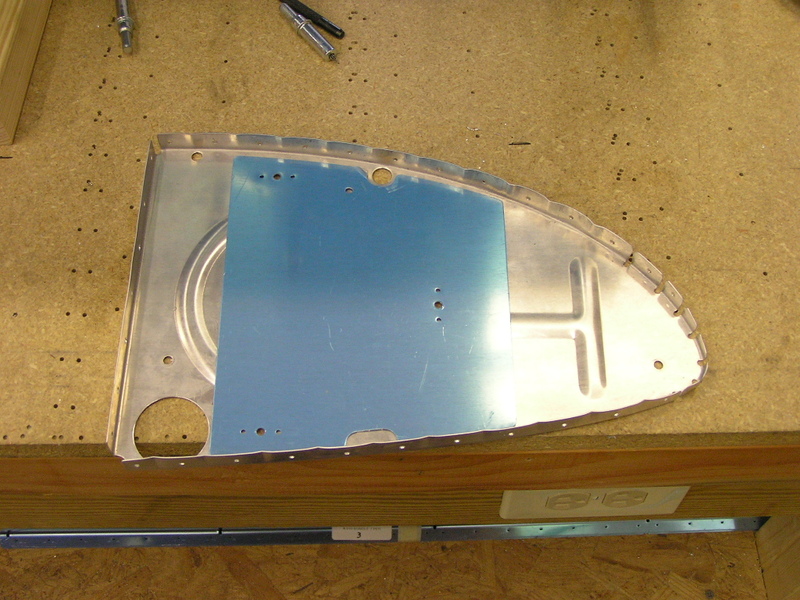 Got started on deburring the nose ribs. 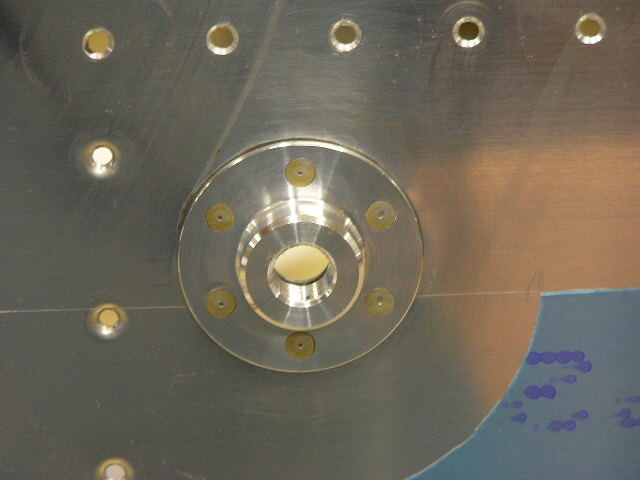 I deburred the flanges using the scotchbrite wheel on the grinder. I deburred the holes using a 1" scotchbrite wheel in the die grinder. Finished the nose ribs. 8/5/06 This evening I tapped the tie-down bars with the 3/8-16 tap I bought at Home Depot. It went exceptionally well. I then bolted the tie-down bracket to the main spar and torqued. 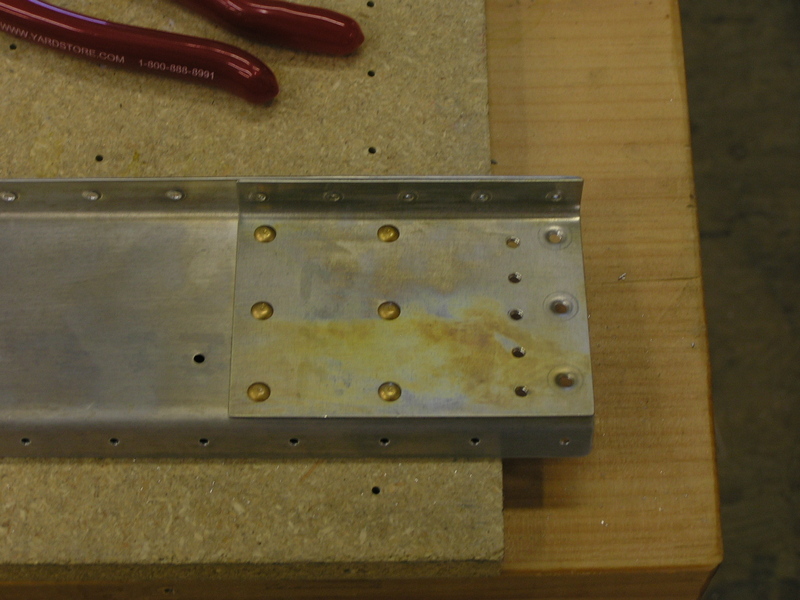 I then bolted the aileron bellcrank brackets. One point here. 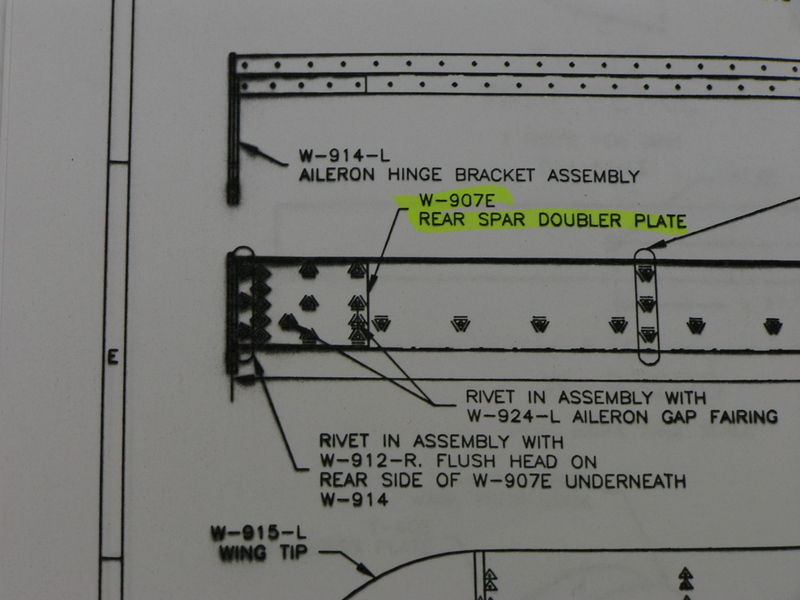 The plans in DWG 11 & 9 show the nuts for the tie-down bracket on the fore side of the spar but DWG 10 shows the bolts on the aft side of the spar...Not sure if it really matters, guess I'll find out down the road. 8/6/06 More deburring of ribs. 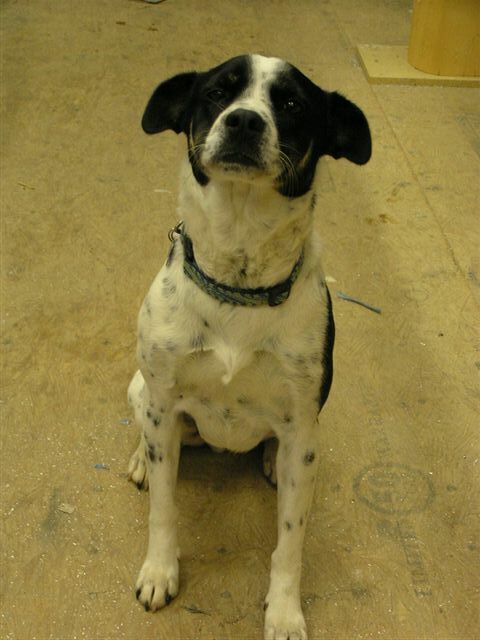 I worked until the temp in the shop hit 90º (1:00pm). Later, I continued deburring. 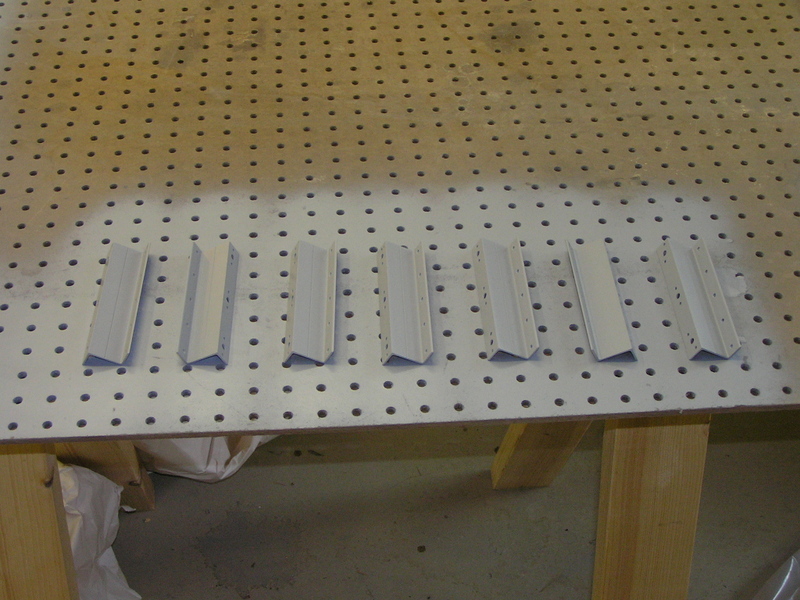 I went ahead and made the aileron alignment tool from a scrap piece of aluminum angle I had. 8/12/06 Match drilled the main ribs to the main and rear spars. 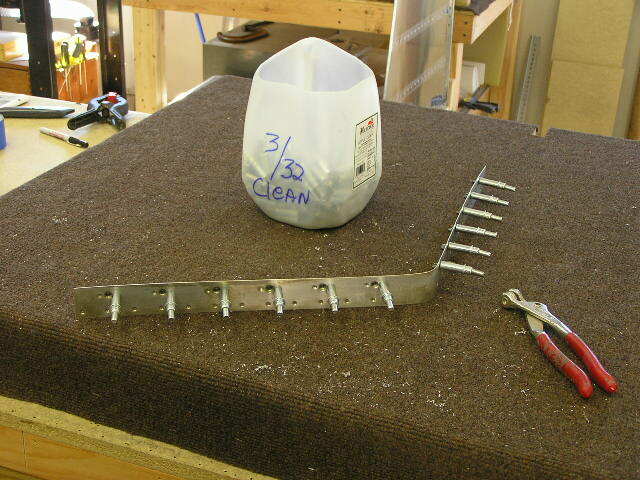 Took it all apart and deburred the spars and ribs. Started the process to chemically treat the main ribs. 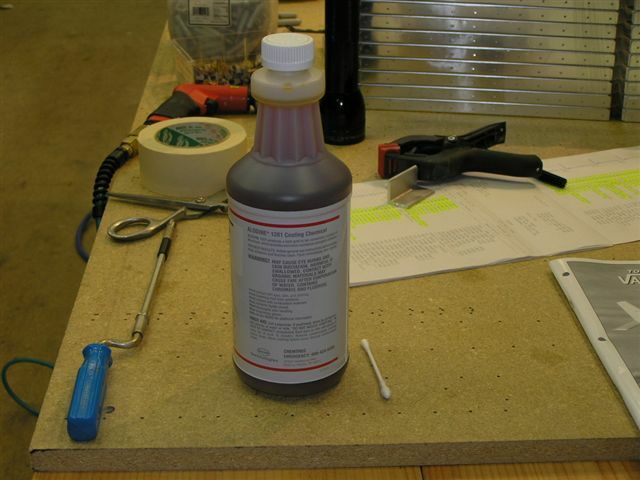 This is a three-step process: 1) scuff the parts with a scotchbrite pad and soapy water; 2) Chemically etch/clean the parts using SanChem (Part C) cleaner; 3) Chemically treat the parts using SanChem (Parts A & B) converter. 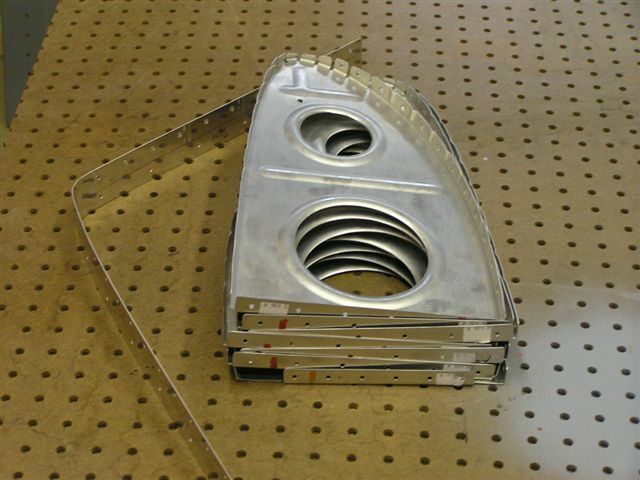 Rinse with water and rivet! 8/13/06 Worked most of the day treating the ribs. It would be MUCH faster to simply clean the ribs and shoot them with a self-etching primer but then you have a coating that can scratch off and adds significant weight. 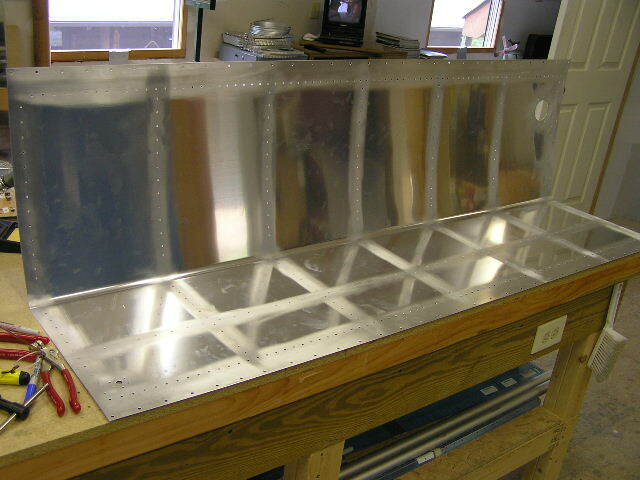 I figure that I will save about 2 pounds per wing by chemically treating the ribs as opposed to conventional priming....And have better protection to boot! 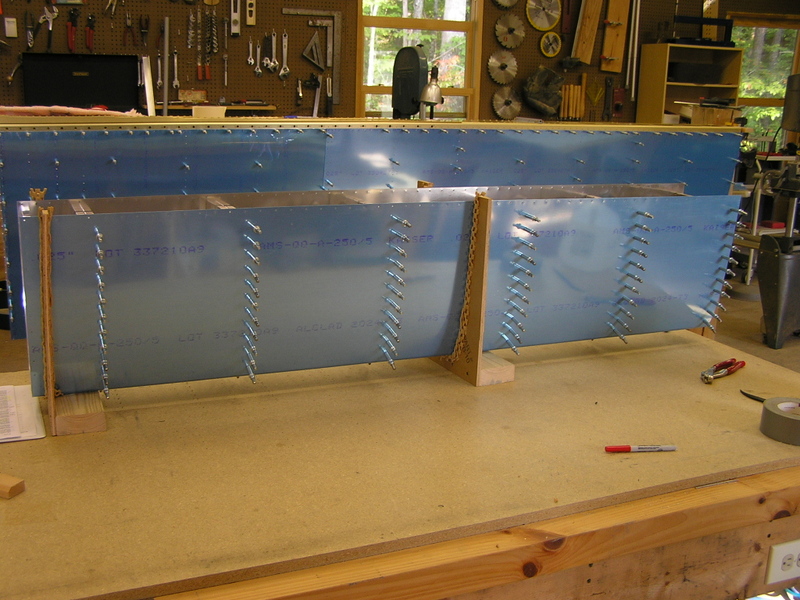 I decided to drill a 0.75" hole in each wing rib to accommodate the wire conduit. 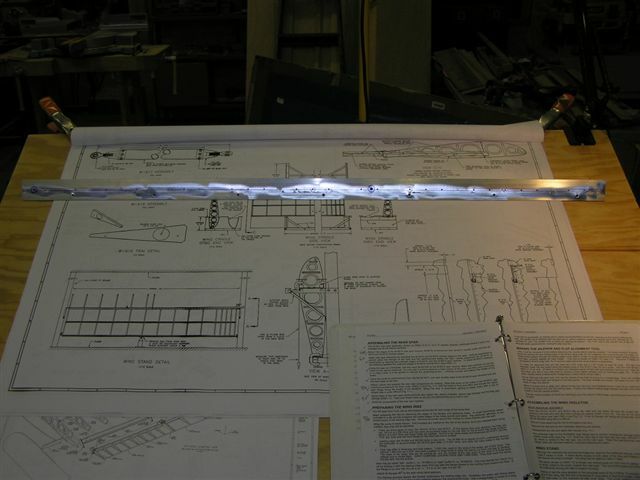 This will provide plenty of access for wiring for the wingtip landing lights, strobe, nav light, under-wing LED, A/P servo as well as possibly a wingtip antenna. 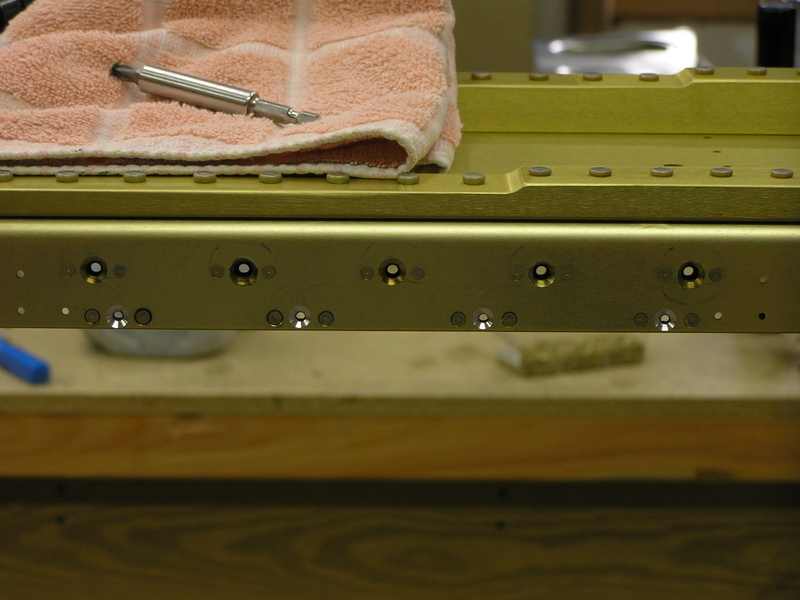 Next, I applied 3M tape to the main spar to protect the anodized finish when I rivet the ribs. 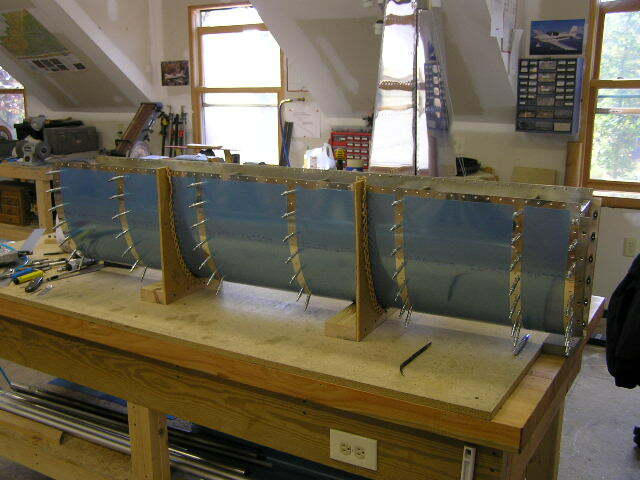 Finally, I clecoed the ribs to the main spar then clecoed the rear spar. 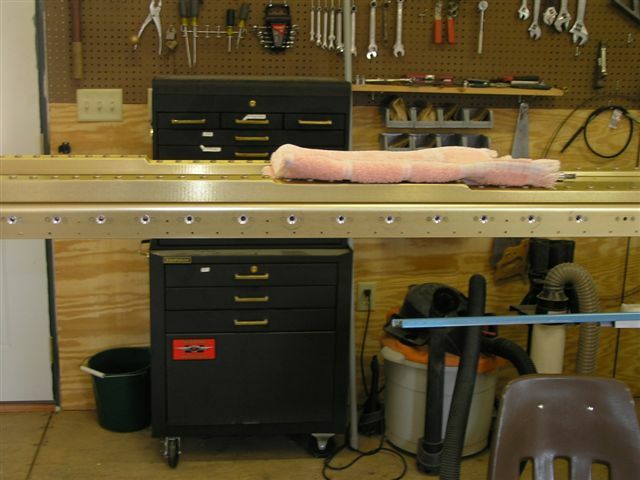 I will rivet the ribs on the bench for easier access then transfer the assembly to the wing stand. 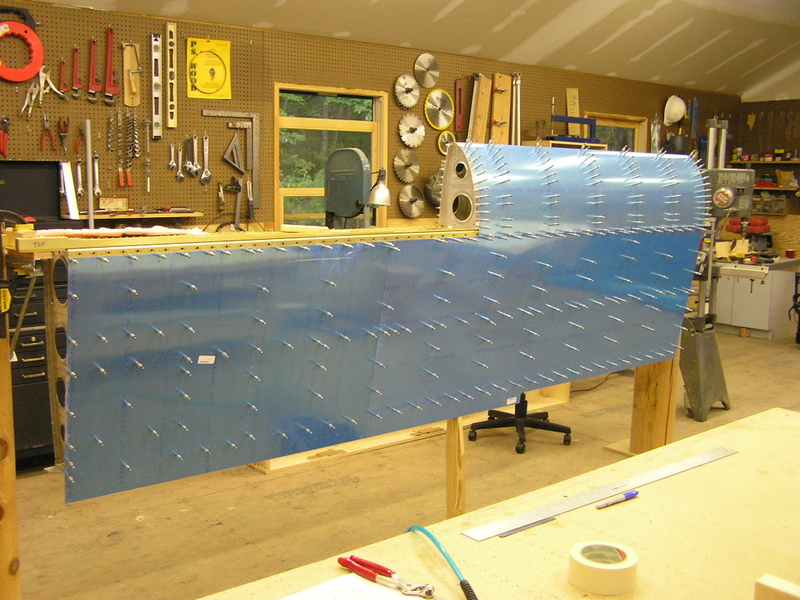 8/17/06 Riveted the ribs to the main spar. 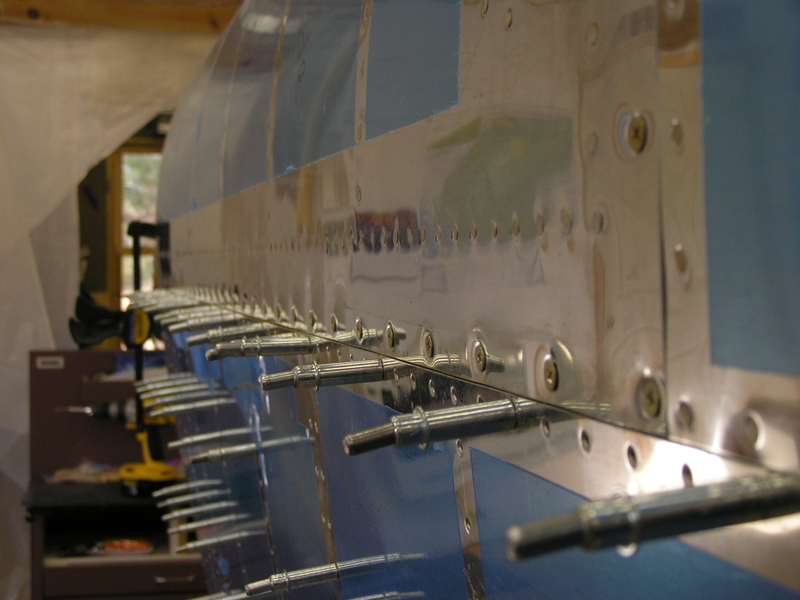 Riveted the ribs to the rear spar. Cut a piece of 1.5 x 1.5 aluminum angle and bolted it to the end rib. 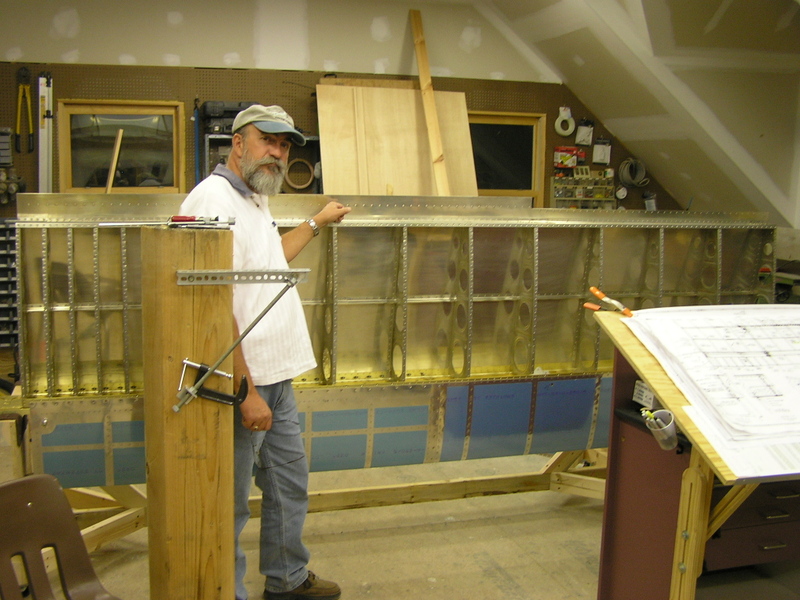 Hung the right wing on the wing stand and clamped the wing down. 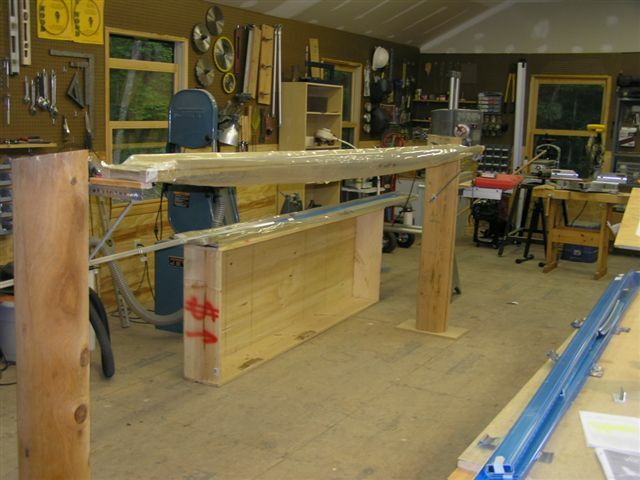 I cut a 1x4 to brace the middle of the wing and placed it under the rear spar. 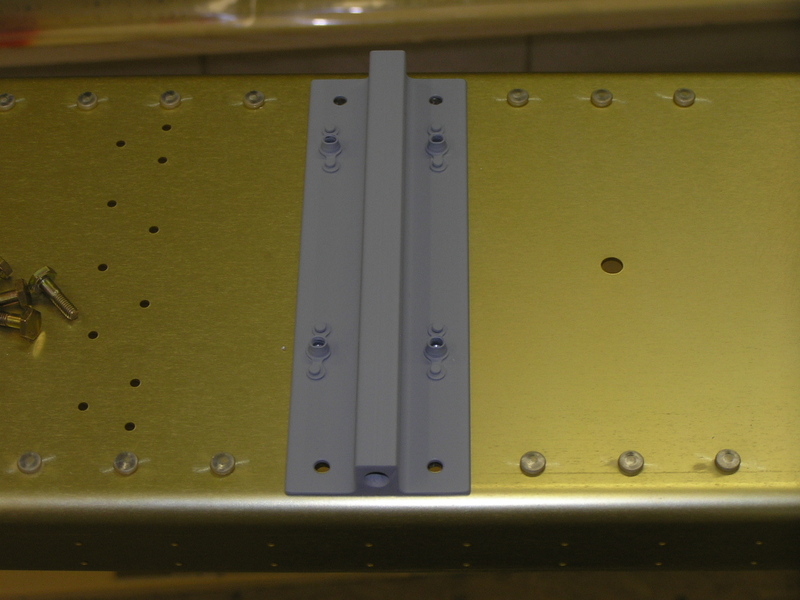 Next, I dug out the W-927 wing walk doubler and placed it under the W-902 inboard top skin. 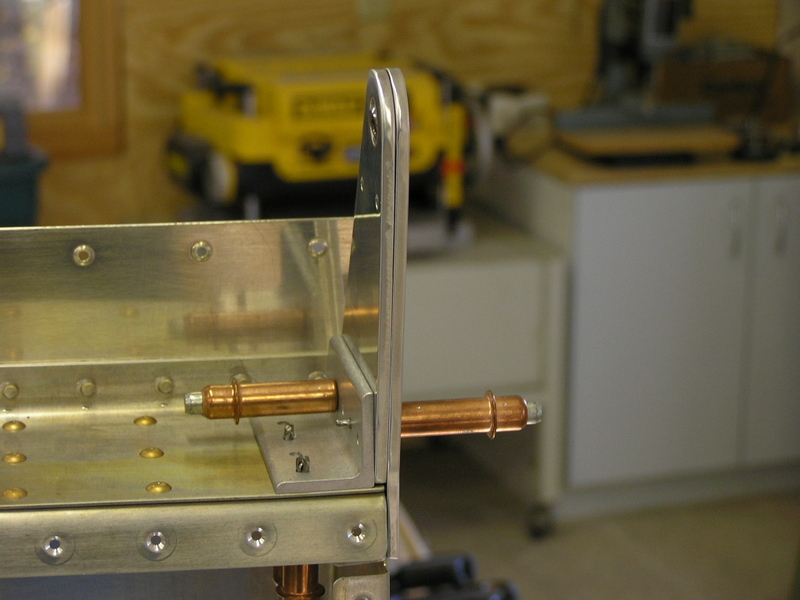 I match drilled the holes in the doubler as specified in the plans. 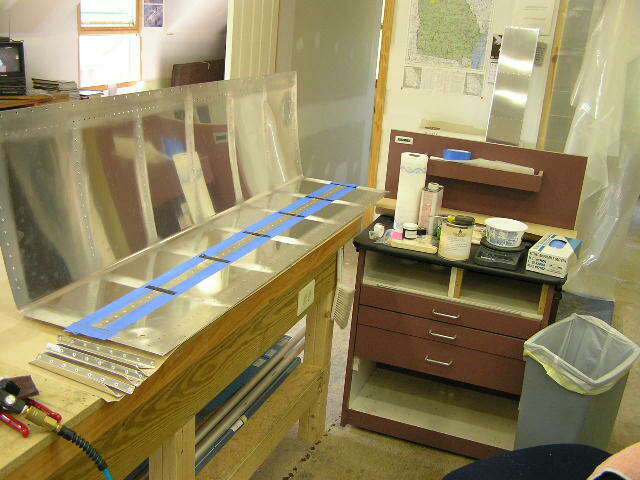 Next, I clecoed on the W-902 & W-903 top skins and the doubler plate. 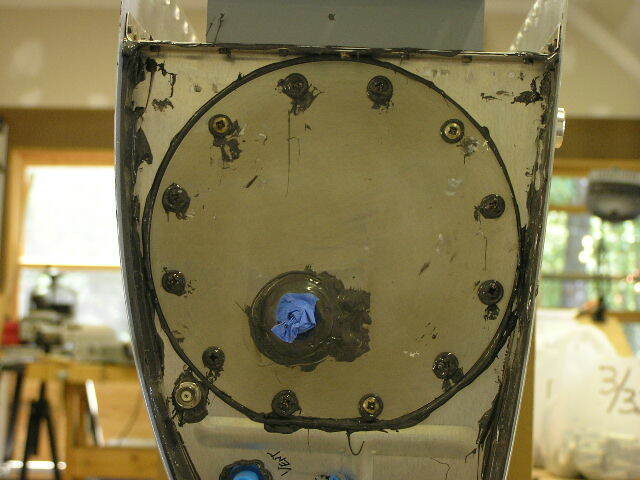 8/19/06 Installed and drilled the W-926A/B J-stringers. Clecoed on the W-904 & W-905 bottom skins. Match drilled and then removed. I went ahead and drilled the wiring conduit holes in the ribs for the left wing since I had the jig set in the drill press. 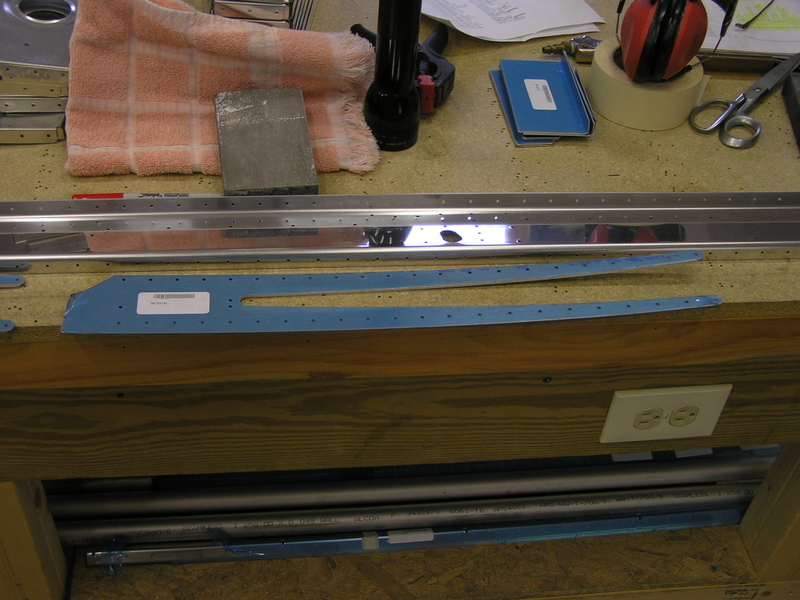 I cut my cradle I had made for my horizontal stabilizer to fit the leading edge and tanks. I inserted the skin and began clecoing the ribs. The bottom went well but trying to cleco the top rib holes was impossible. After much head scratching I resorted to using clamps. I used a block of wood and the holes lined up perfectly. 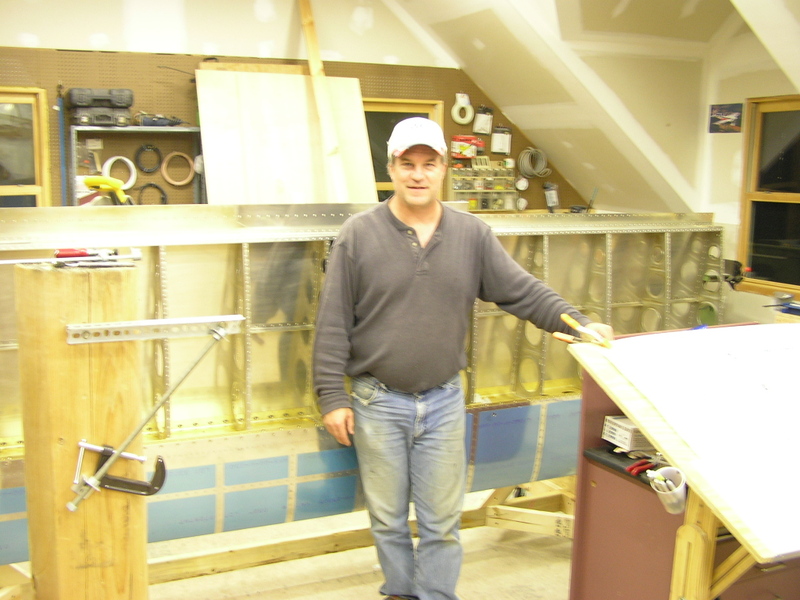 I mounted the leading edge on the wing stand and clecoed it to the spar. 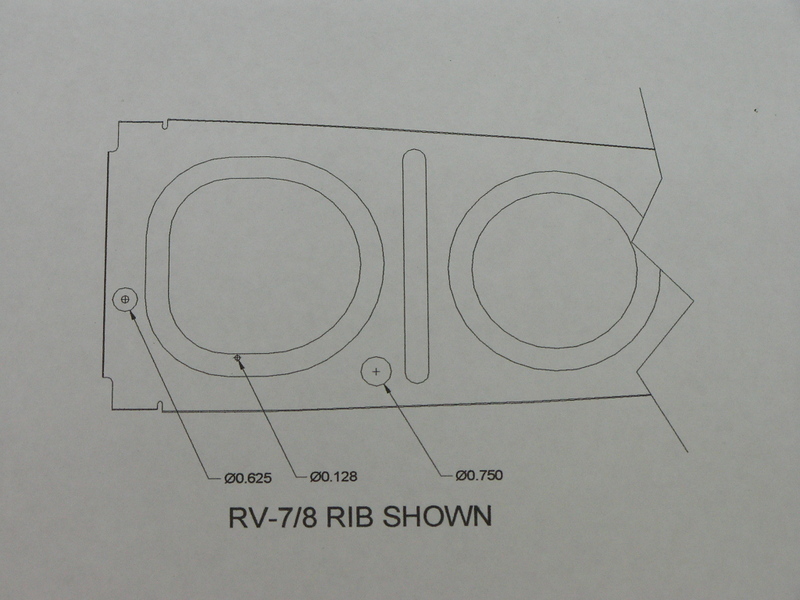 I fabricated the W-919 Doubler strip and "worked" it until it was properly aligned between the W-901 skin and the W-908 rib. 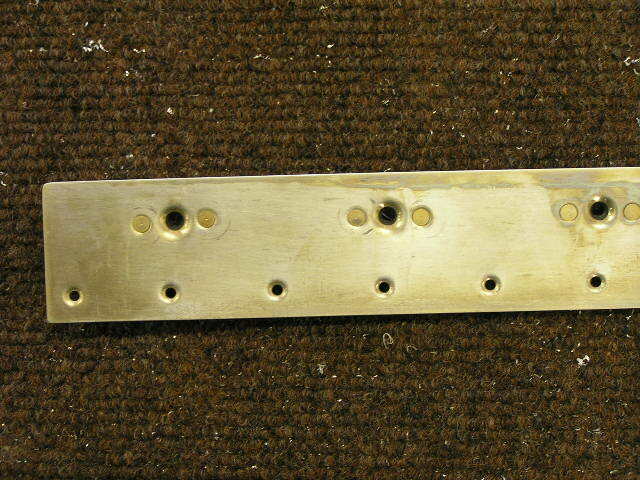 I then match drilled the holes and clecoed. 8/20/06 I will need to order some more 3/32 clecos as well as a few 3/16 clecos. 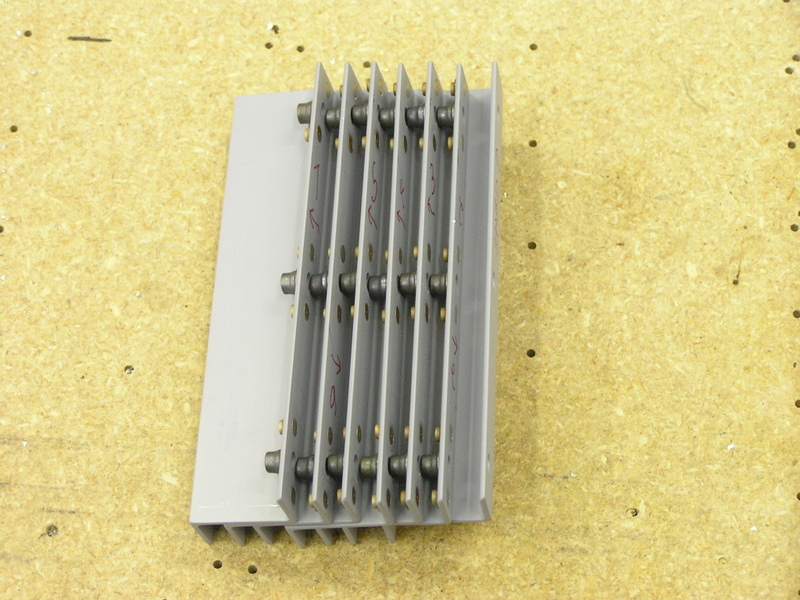 I opened up the capacitive senders and tried to get an idea how they will go in the tanks. 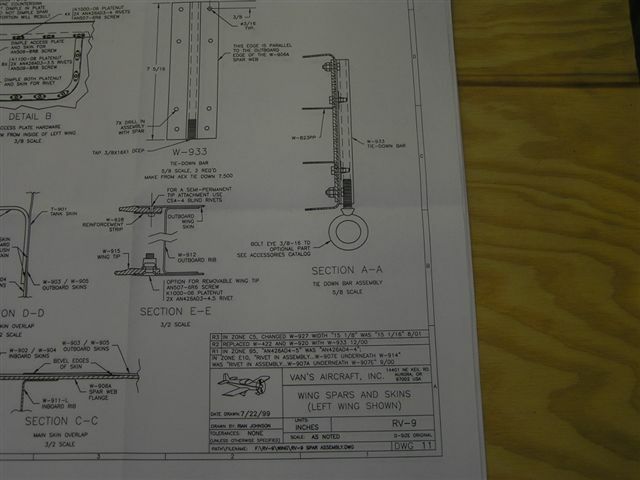 The plans come with a full-scale drawing so it should be pretty straightforward. I put the right tank skin in the cradle and clecoed the ribs. I had to use my board and clamping technique in order to get the clecos in but it worked. Next, I trimmed the T-911 and T-911-INBD stiffeners, deburred and match drilled them to the tank skin. 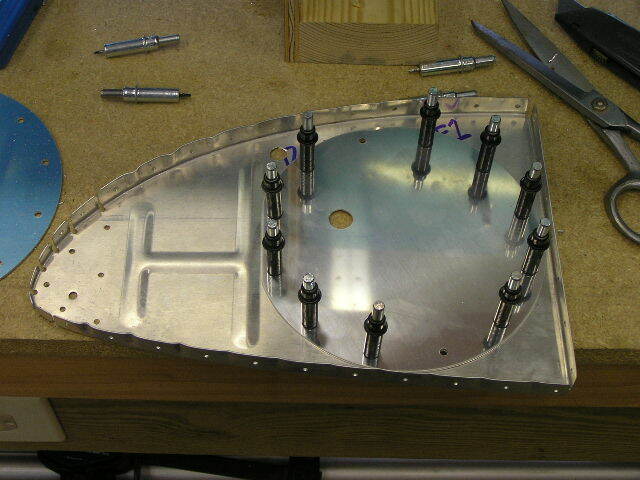 Next, I carefully oriented the attach angles on the rear baffle. 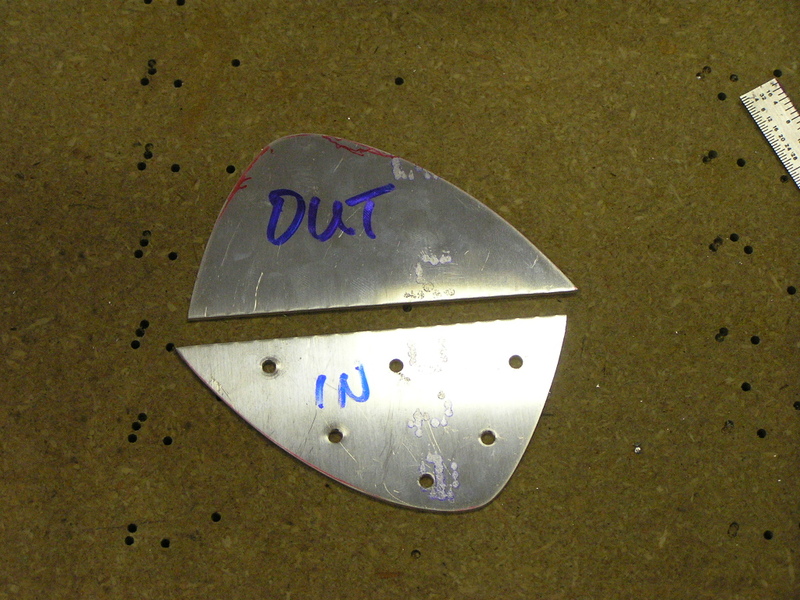 Then, using the W-932DG drill guide, I drilled each attach angle. 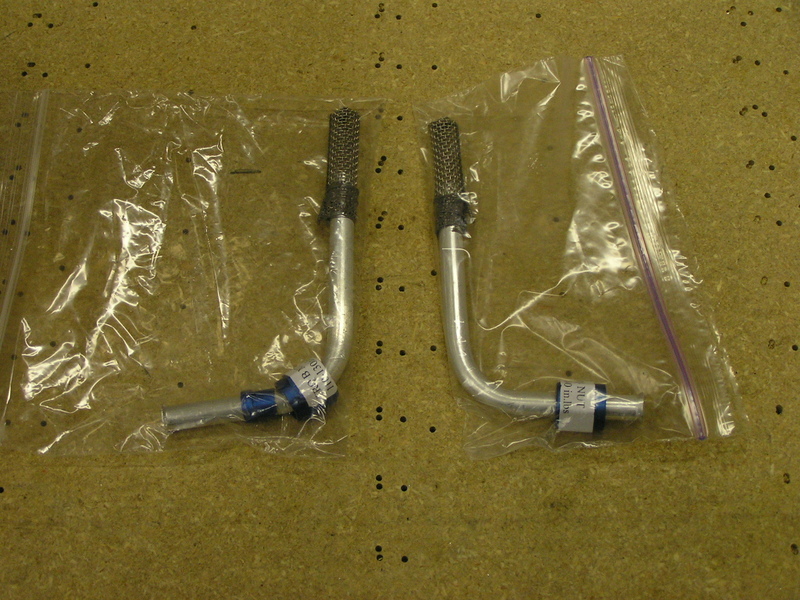 8/25/06 Today I received the pre-fabricated fuel pick-up tubes that Van's sells. Thanks to Bill Repucci for the heads-up! Pop riveted the attach angles to the baffle. 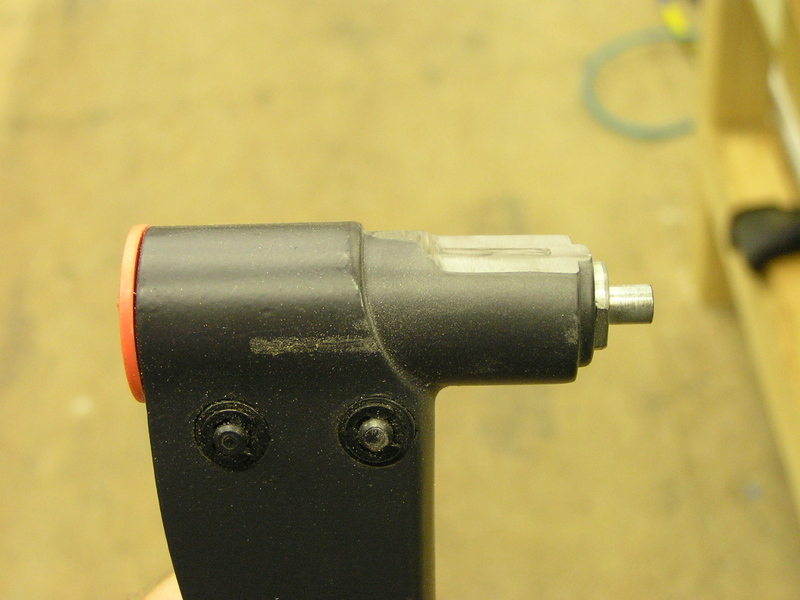 I had to grind down the head of my pop rivet gun in order to set the pop rivets in the attach angles. Placed the tank on the spar and clecoed the T-901 tank skin to the spar. 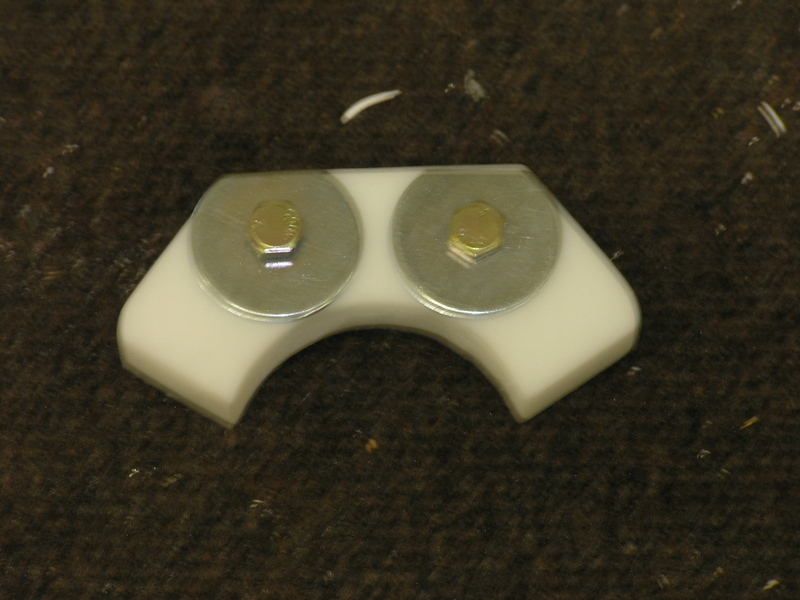 Using 3/16" clecos, I attached the attach angles to the spar and match drilled the attach angles. 8/26/06 Removed the tank from the spar and placed back in the cradle. Drilled all the holes to final size. 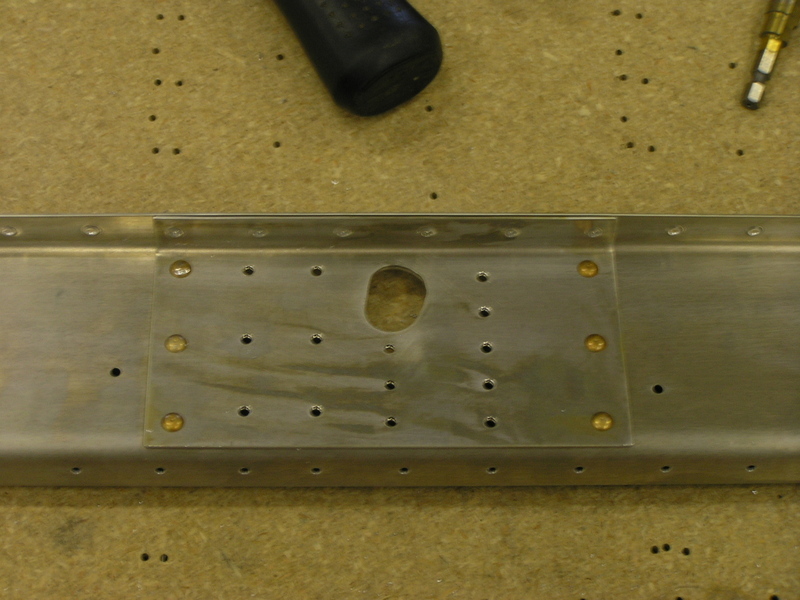 Countersunk the rivet holes in the W-901 skin where it will attach to the baffle. 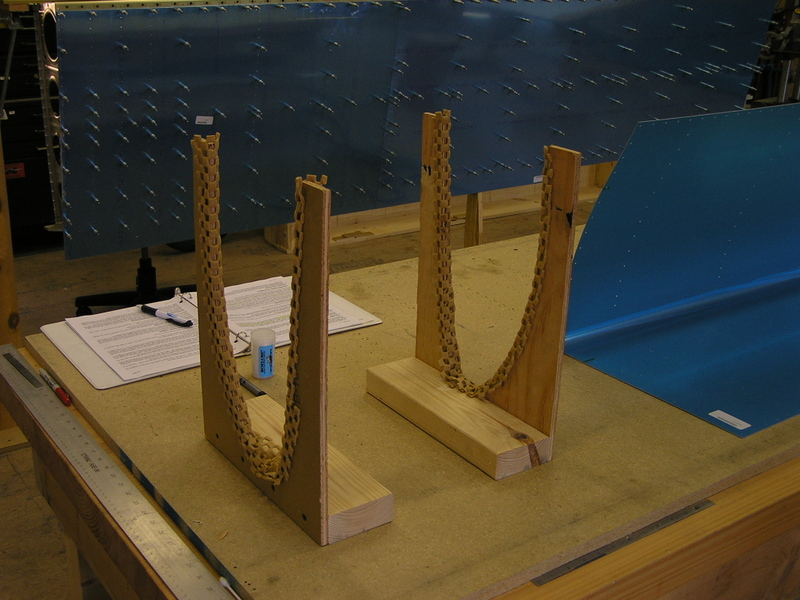 Drilled the spar attachment screw holes to final size (#19). 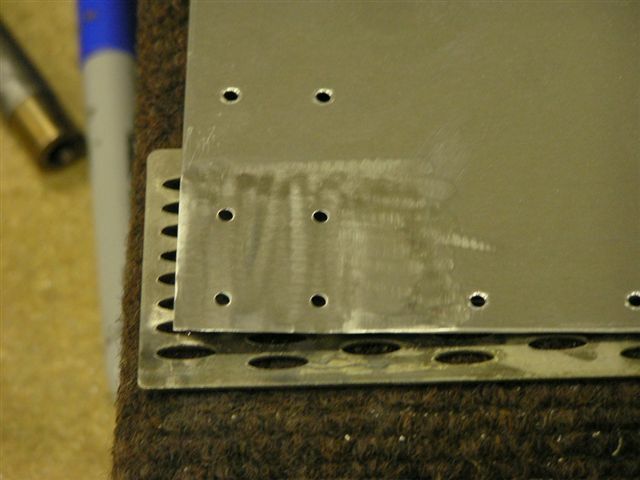 Removed the attach brackets from the baffle by drilling out the pop rivets. 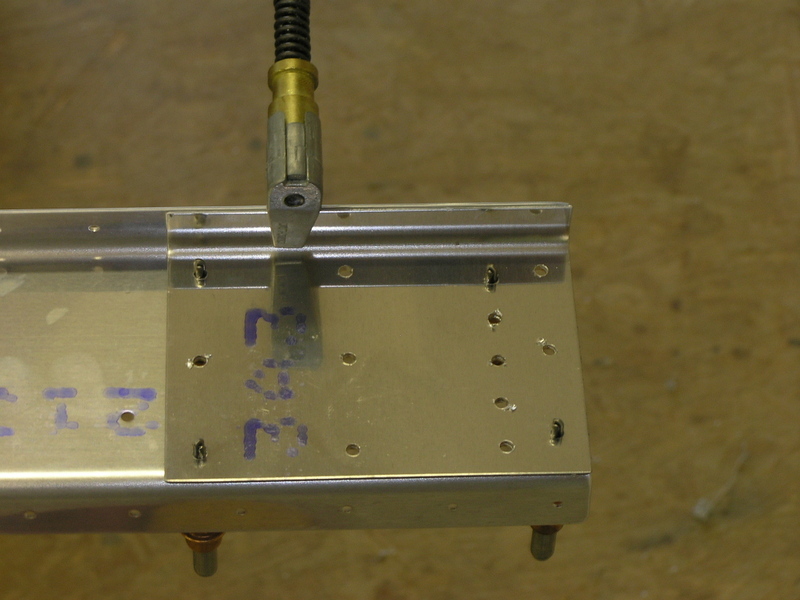 Drilled the attach brackets for K1000-3 platenuts. Countersunk the brackets and washed down with MEK. 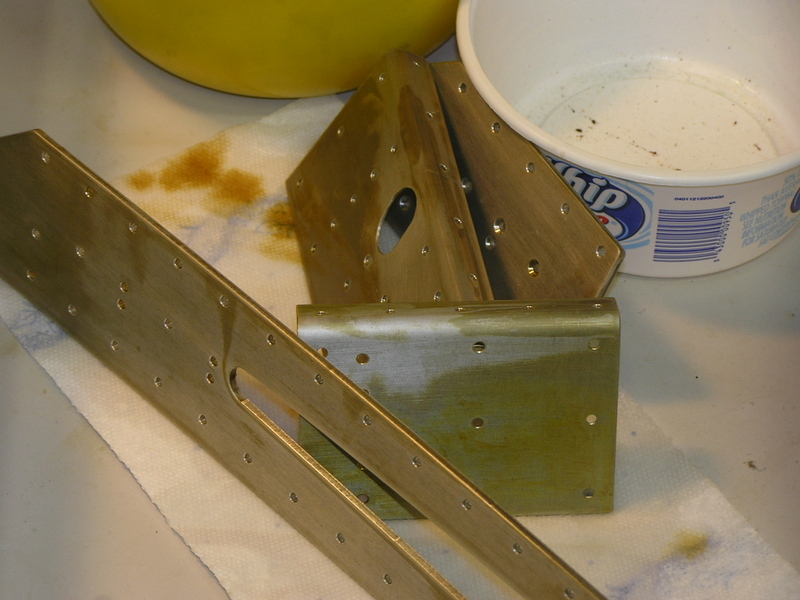 Primed the brackets with SEM self-etching primer. 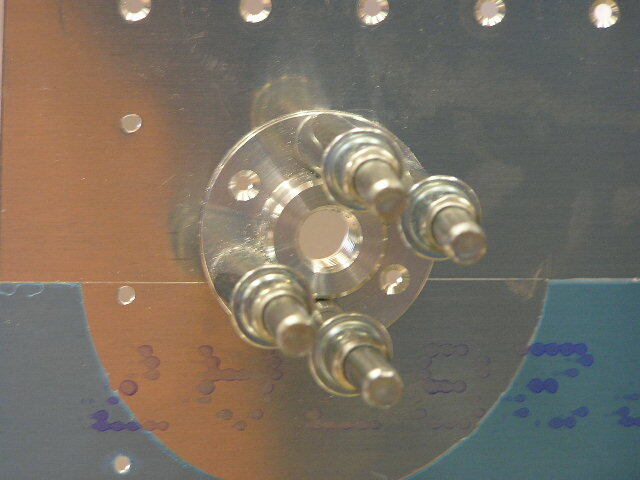 Attached the K1000-3 platenuts to the spar. 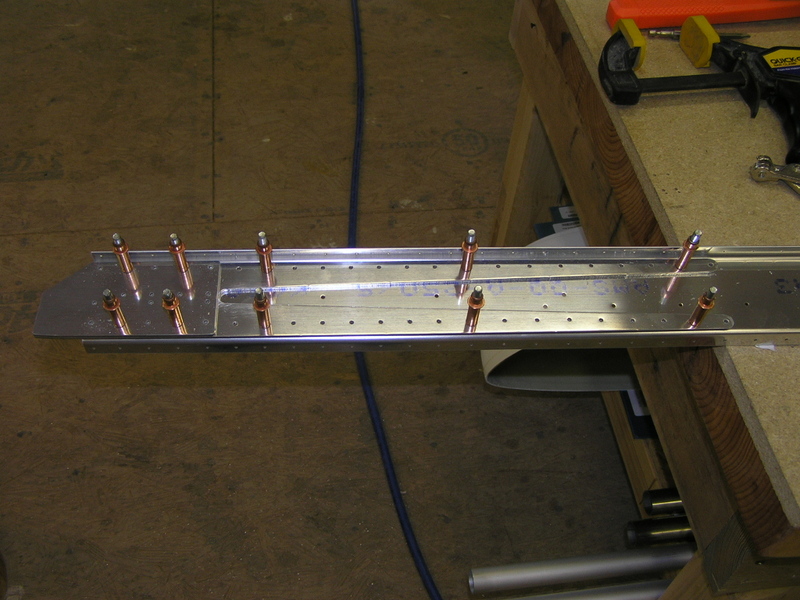 Riveted the platenuts to the attach brackets. Fabricated the T-905 attach angles by first tracing the pattern on to a piece of paper and cutting out the pattern. 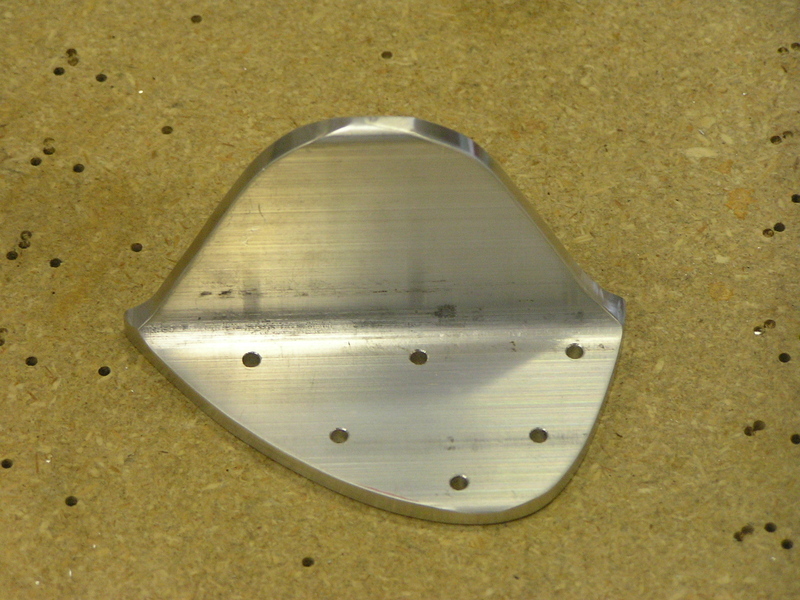 I then transferred the pattern to the piece of aluminum angle. I also marked out the pattern for the left tank. 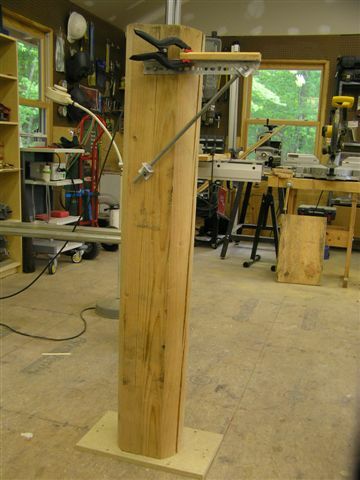 I then rough-cut the angles using the bandsaw. I used the bench grinder and oscillating drum sander to finish trim the angle. I match drilled the attach angle to the inboard rib. 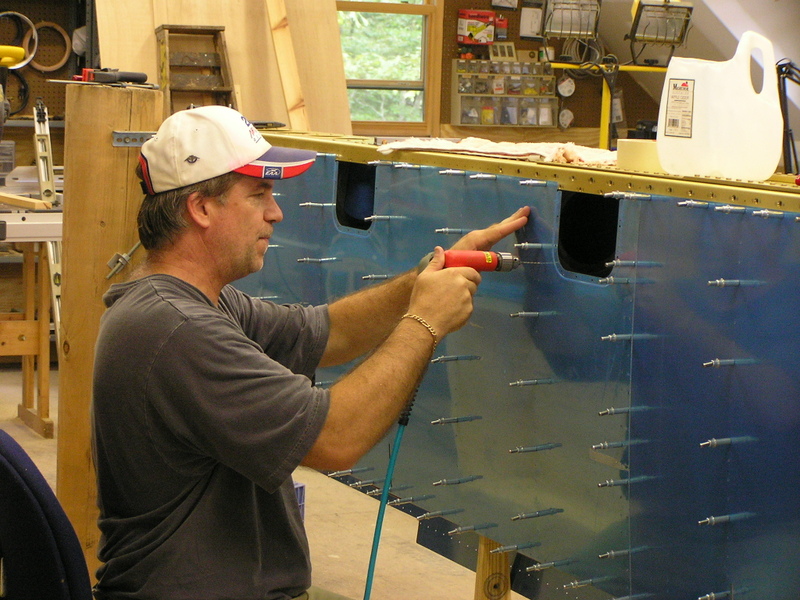 8/27/06 Fabricated the T-410 reinforcement plates to the inboard and outboard ribs. Match drilled the T-410 to the inboard rib. I assume the outboard plate will be attached to the rib with proseal. 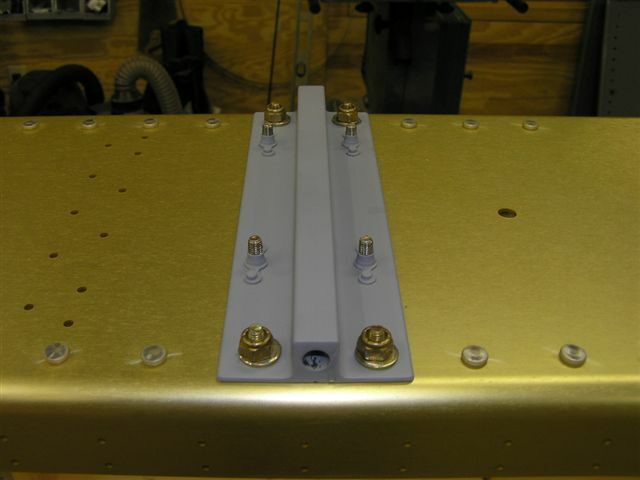 Capacitive Senders: I match drilled the capacitive sender plates to the second and sixth ribs per the plans. I also drilled the notch in the snap bushings. Drilled the 3/8" hole for the BNC connector in the inboard rib. 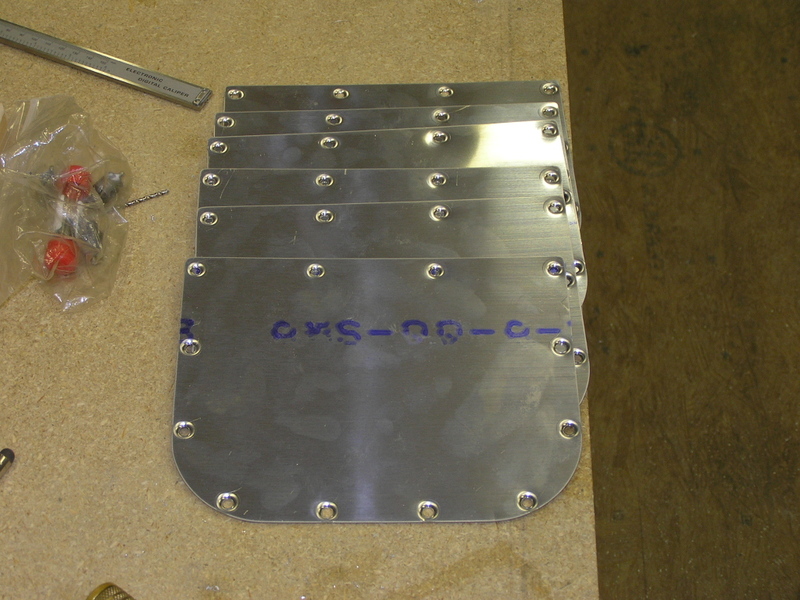 Riveted the platenuts in the capacitive plates. 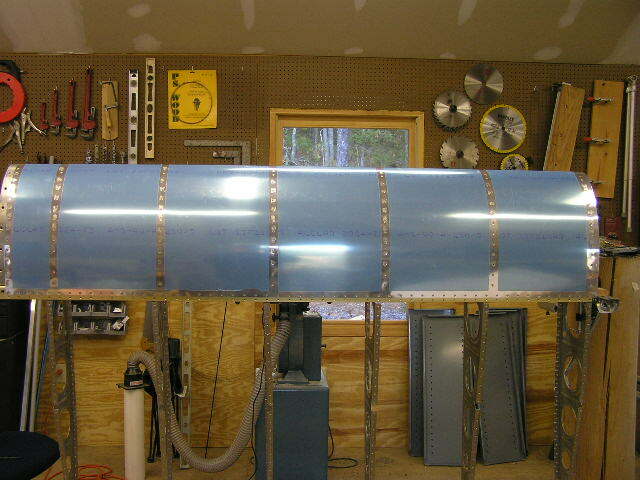 I will wait for final install after the ribs are prosealed and before the baffle goes on for good. 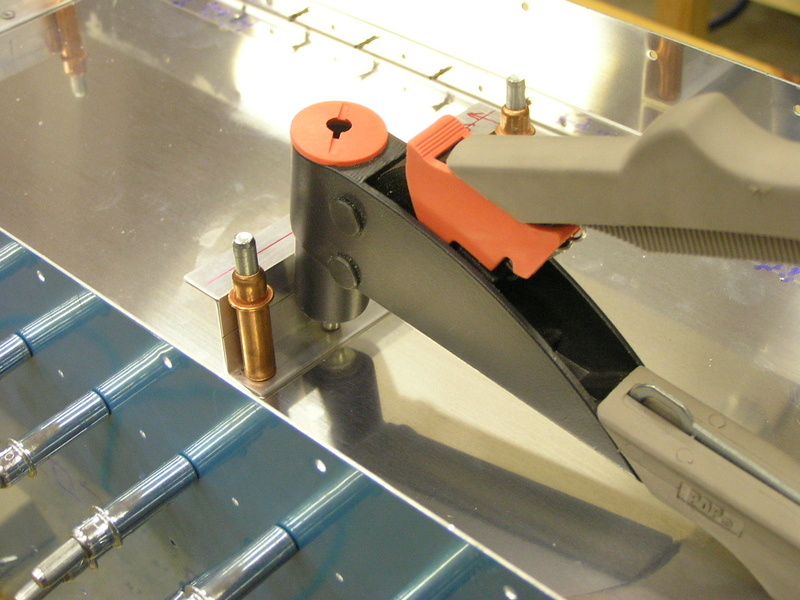 Used the fly cutter to cut the access hole in the inboard rib. Match drilled the T-411 plate using the T-407 stiffener ring for the platenuts. 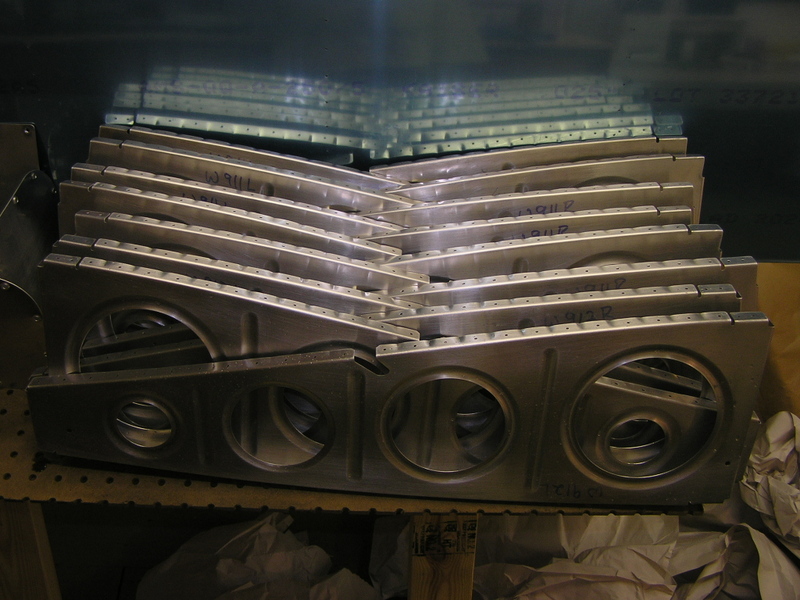 Deburred and countersunk the T-407 and riveted the platenuts. 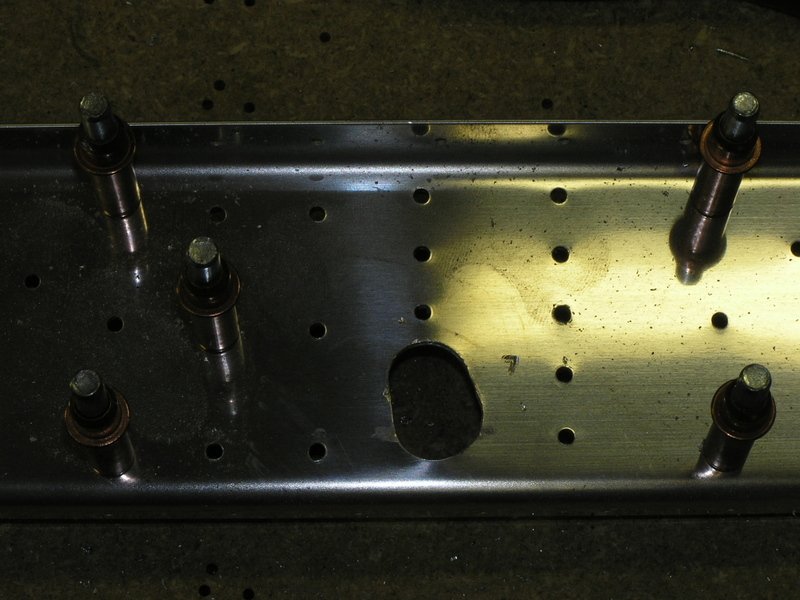 Drilled the hole for the fuel pick-up since the T-411 plate did not have it pre-drilled. 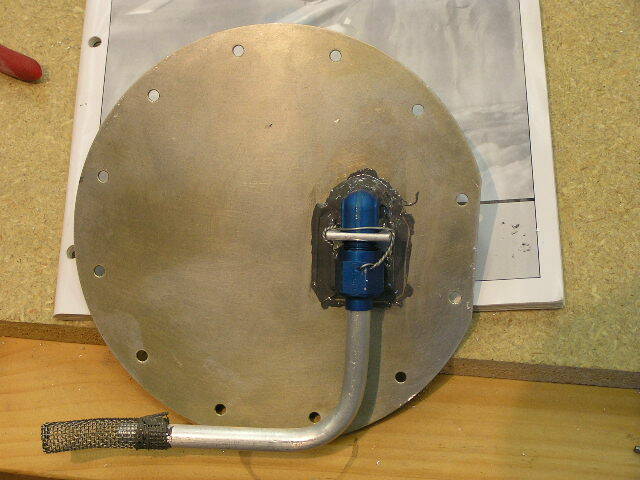 Fit and drilled the T-406B fuel cap flange. 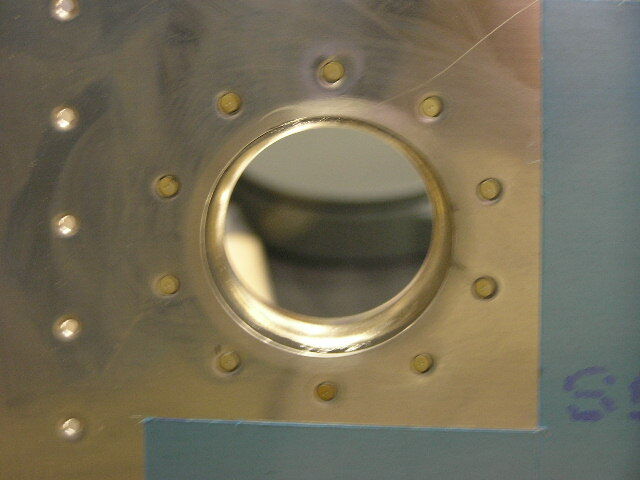 Deburred and countersunk the flange. I also fabricated the T-914 clips from a scrap of .020. 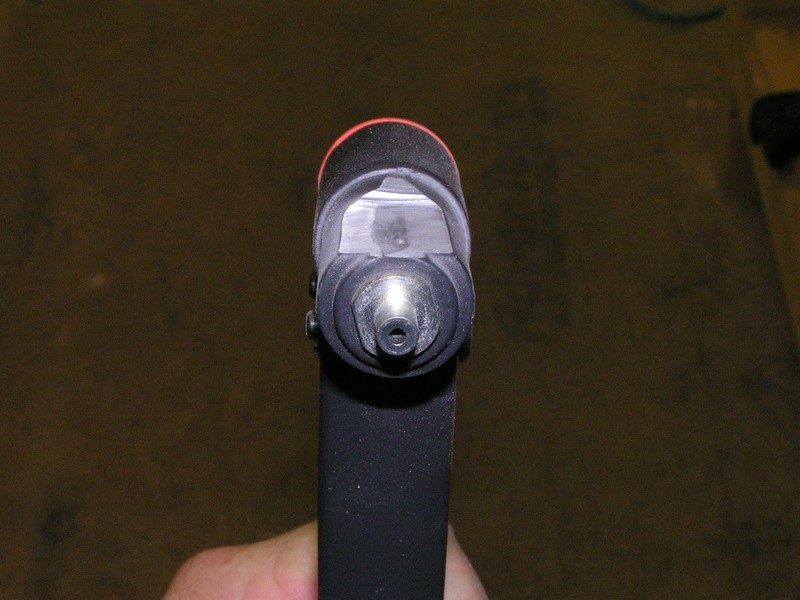 I used a piece of hinge pin to check the alignment for the clip. 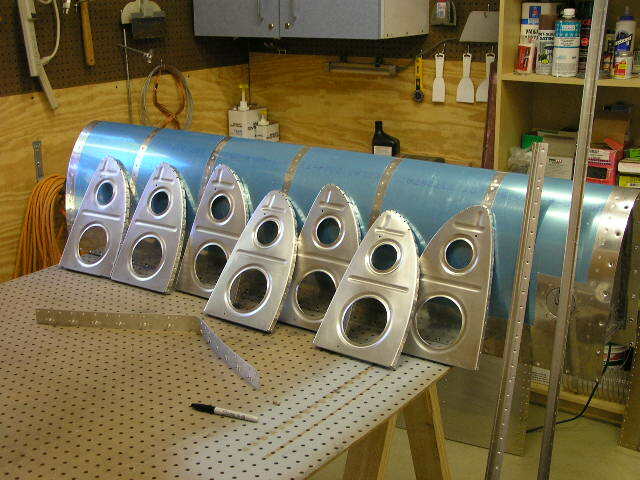 9/2/06 I decided on a location for the fuel return and drilled the holes in ribs #2 and #3 for the fuel return line and deburred.. The line will run to the third bay. Deburred skin. 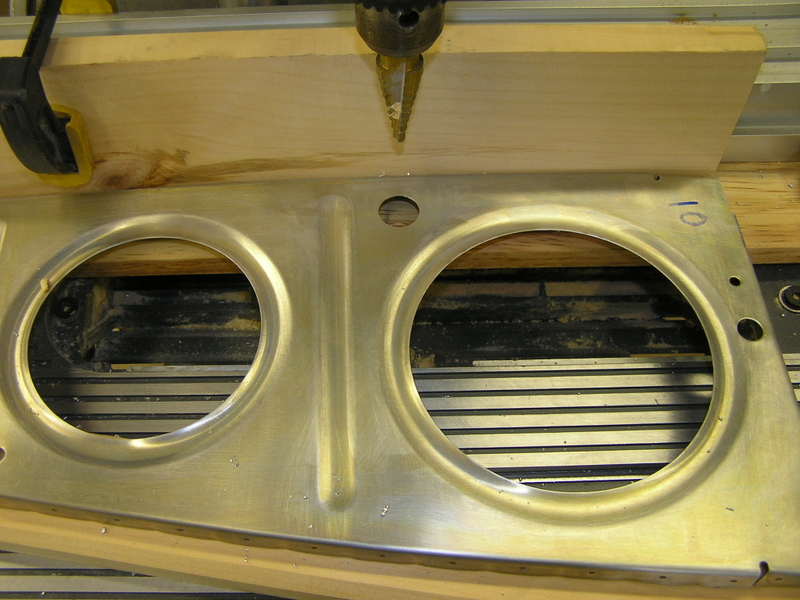 Fabricated the small plate for covering the tooling hole in the outboard rib. 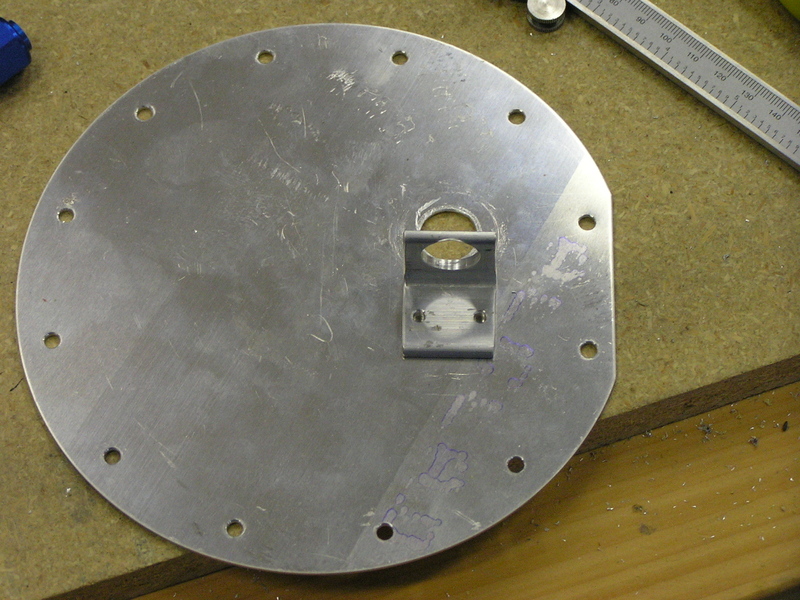 Drilled and deburred cover plate. Dimpled tank skin and stiffeners. Mixed 10 oz. 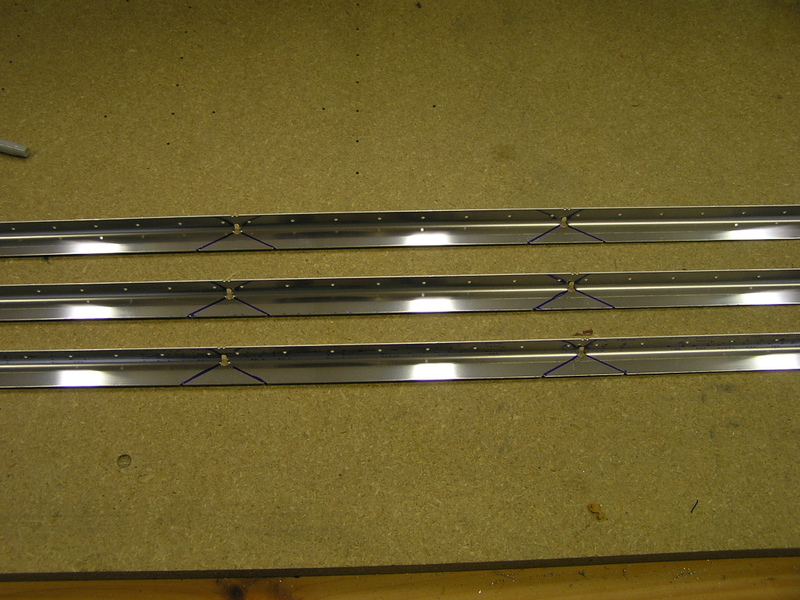 of proseal and back-riveted the stiffeners to the skin. 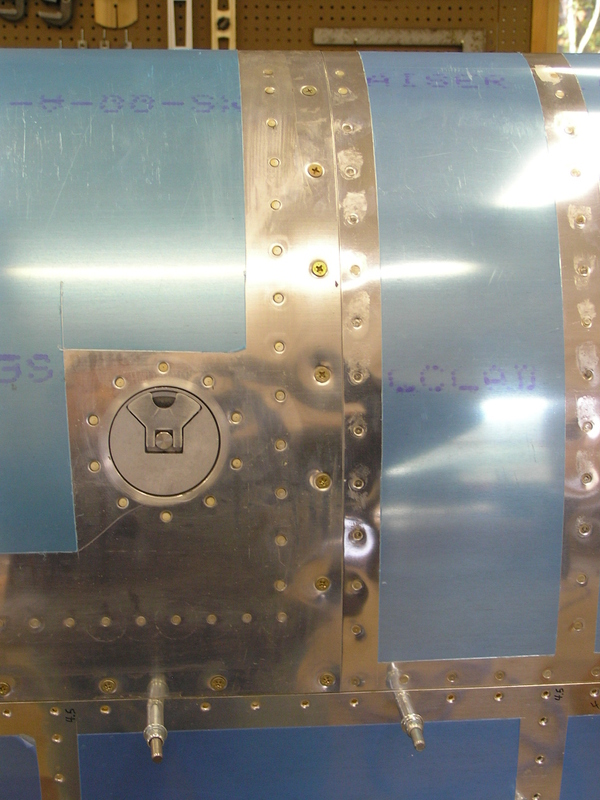 Prosealed and back-riveted the T-406B fuel tank flange and vent clip to the skin. 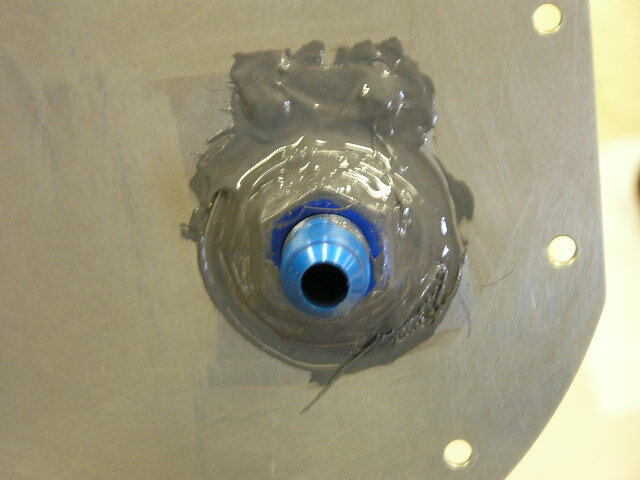 Prosealed and used the pneumatic squeezer to attach the VA-112 fuel drain flange to the skin. 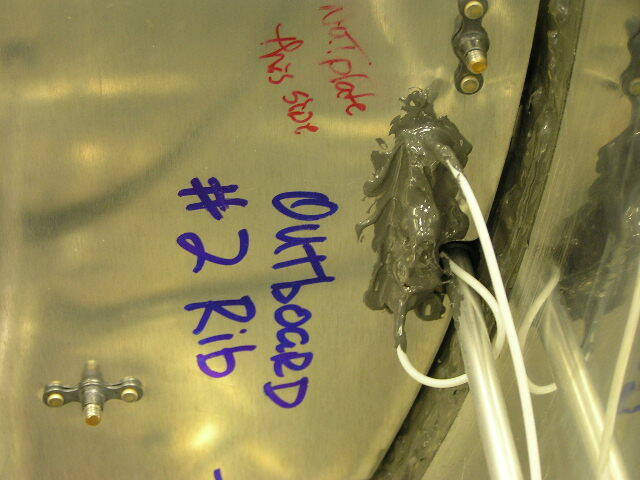 9/3/06 Having survived my first real episode of ProSealing, I moved on to the riveting of the ribs. I placed the tank skin into the cradle and clecoed the ribs. I taped off beside each rib leaving about 1/4" for the final filet. I mixed up 5 oz. of ProSeal and mixed thoroughly. Skipping the outboard end rib (#7), I removed rib #6, cleaned the skin and rib thoroughly with MEK, applied a 1/16th" coat of proseal to the skin, inserted the rib and clecoed every hole. I then repeated the process on ribs #5 and #4 then I began riveting the skin to the ribs. This is where it really got messy. I would pull a cleco, insert a rivet, set the rivet then repeat on the other side. 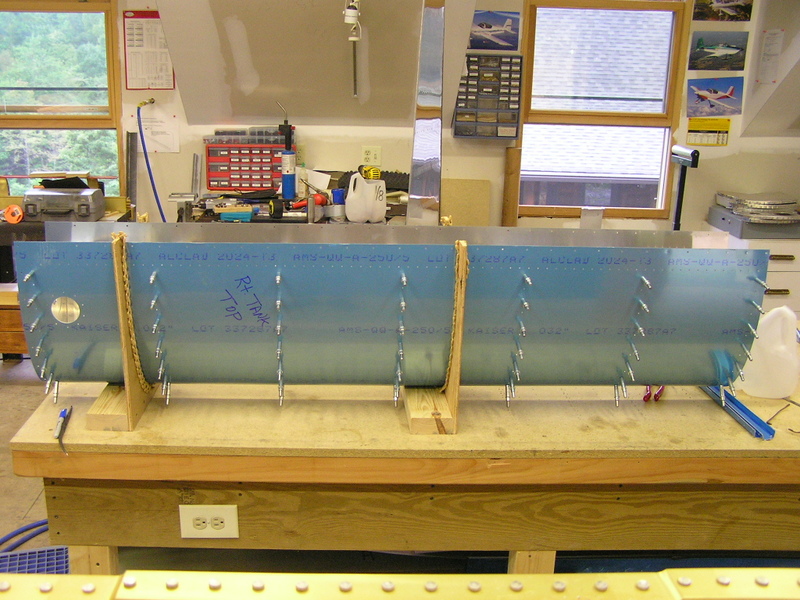 By the time I finished riveting all three ribs and started covering the shop heads of the rivets, the proseal was really starting to set-up (3-hours). I was able to extend the pot-life of the proseal by refrigerating it before mixing. 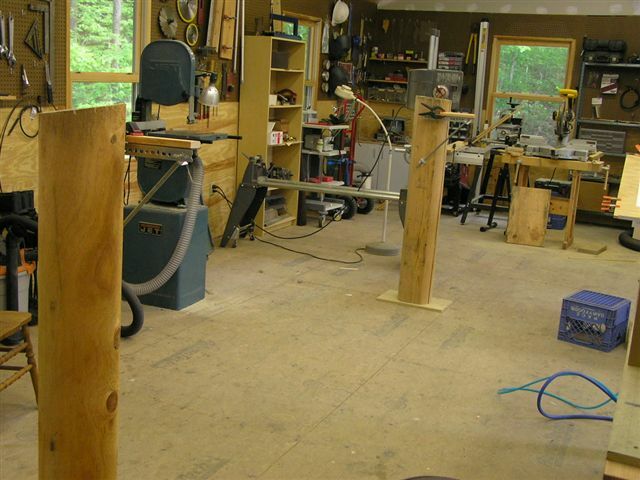 Although the shop temp was about 78º, I got over 3- hours of workable time. I also think I will re-hit a couple of areas when I mix the next batch of proseal just to be on the safe side. I had a rivet that appears to be split. This is possibly from over-driving it with the rivet gun. I'm gonna get a couple of opinions as to whether I should drill it out or let it alone. 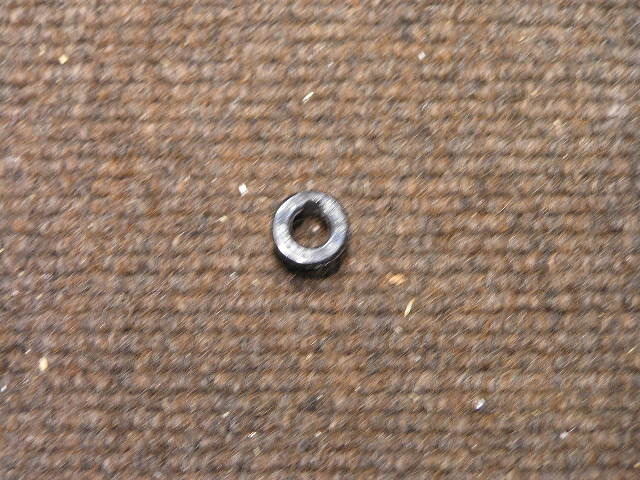 9/4/06 I went ahead and drilled out the cracked rivet with a 3/32" bit. I used the next-size-up rivet (4.0) and flattened it a little using the pneumatic squeezer to make it a little fatter. It went in nicely. I moved ahead and prosealed and riveted ribs #2 & #3. 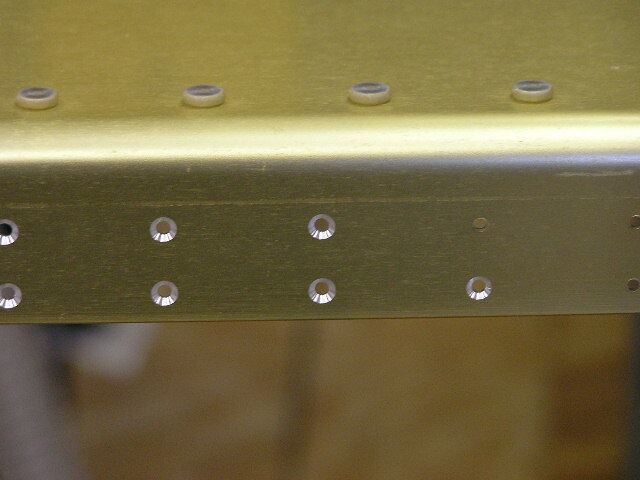 Incidentally, I had three rivets I was not happy with so I did the "drill-out routine" again. I'm actually getting pretty good at this! After cleaning up, I worked on the capacitive senders by soldering the 15-inch sections of 18 AWG wire to the BNC connectors. 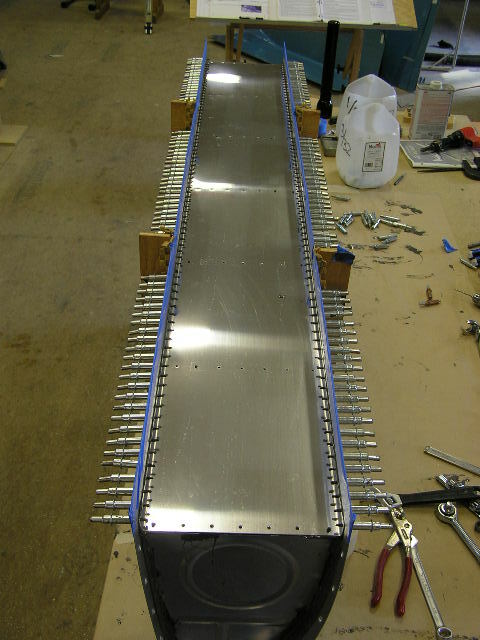 I also cut two 46-inch sections and crimped and soldered ring connectors on one end. 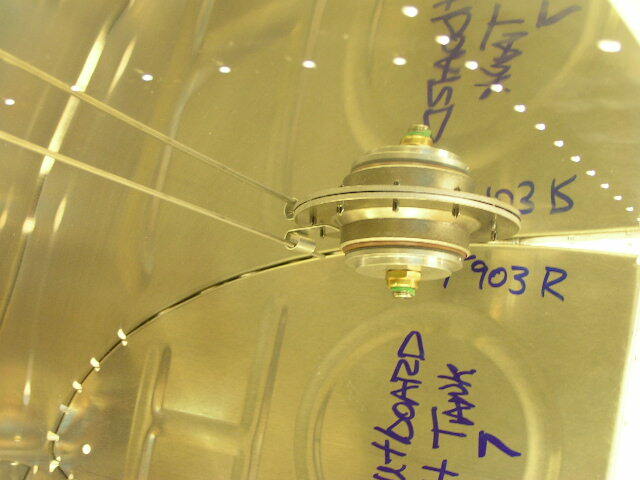 The wiring for the cap senders will have to be completed during final installation of the tanks. 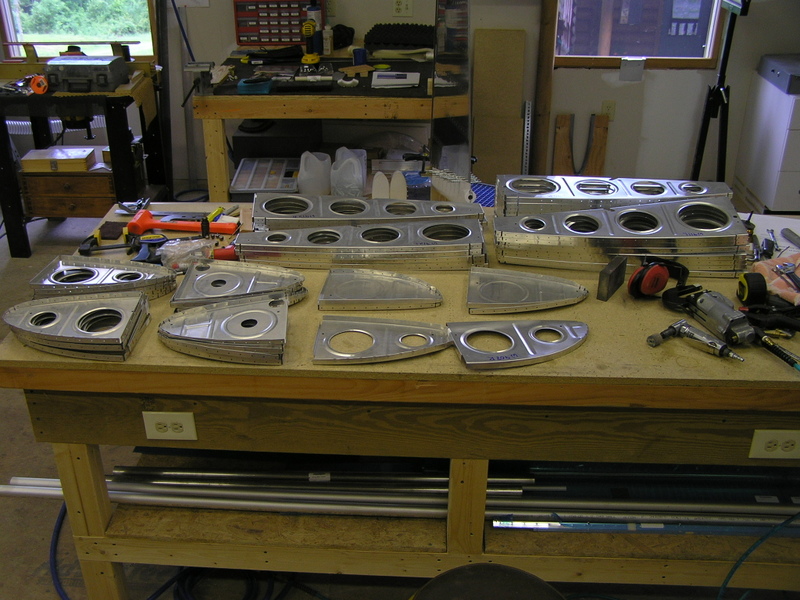 I went ahead and mixed up another batch of proseal and riveted the inboard and outboard ribs. 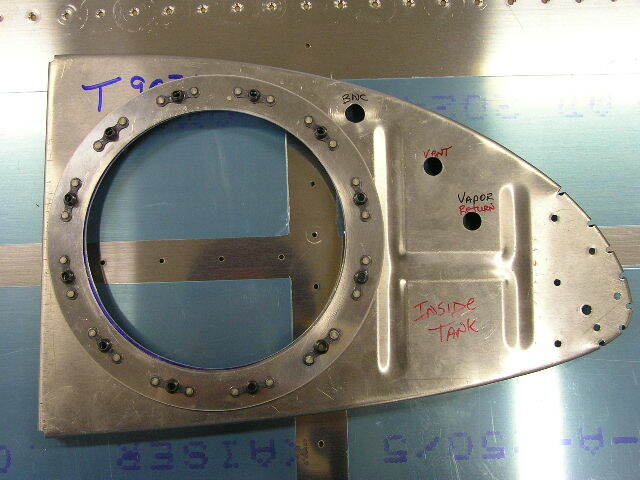 I also prosealed and riveted the T-905 attach angle and the T-410 reinforcement plates. Finally, I mixed up a small batch of proseal and made sure to cover the shop heads of all the rivets and ensured good filets. 9/7/06 Worked on the tank plumbing. I had to clean the proseal splatter from the vent line holes in order to get the snap bushings to seat correctly. 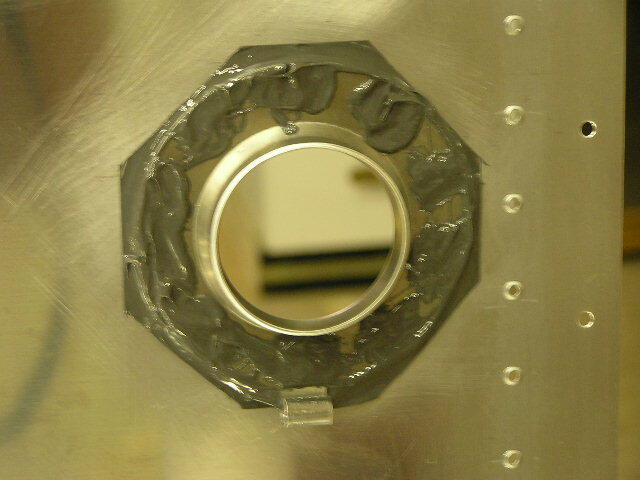 Then I installed the vent tube, bent the tube to mate with the fitting and cut to length. I then flared the end and loosely assembled the fitting and tube. 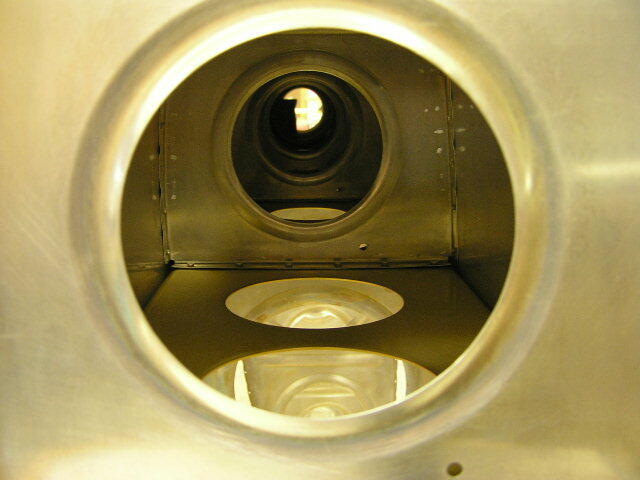 I repeated the process for the fuel/vapor return tube. I decided to extend the tube to empty into the 3rd bay. This should allow the warm return fuel to cool adequately before being drawn out again. 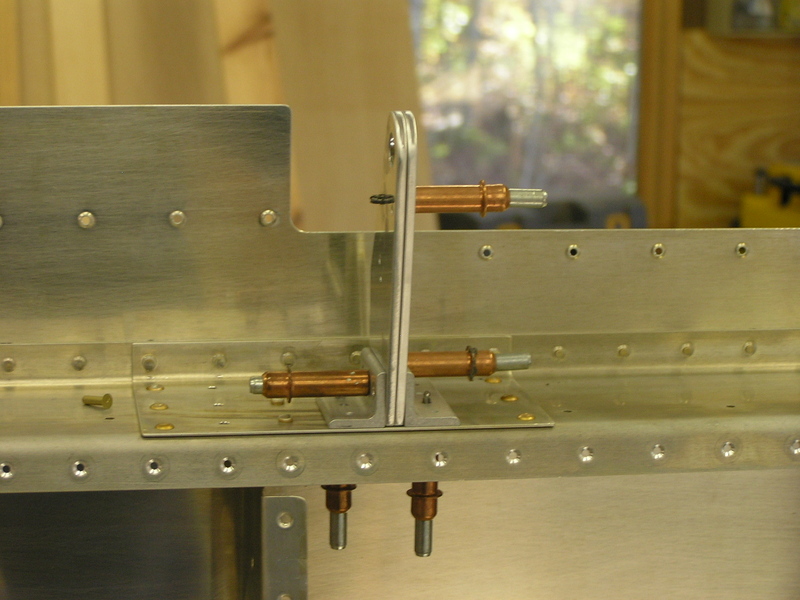 I test fitted the fuel pick-up tube and fitting to the tank access plate. 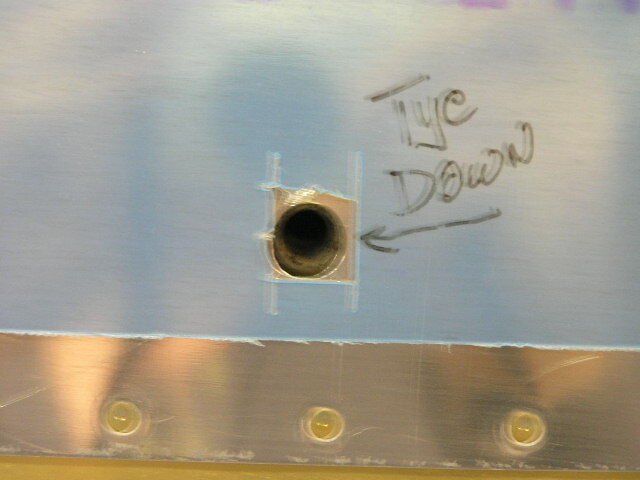 This line and fitting is 3/8" where the vent line and fuel return are 1/4". 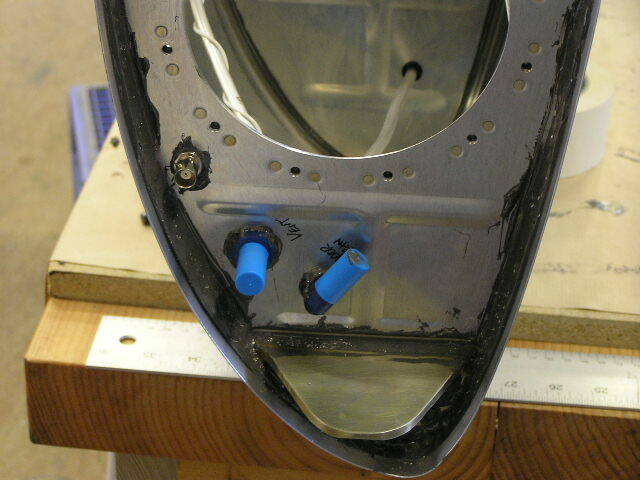 I fabricated the anti-rotation brackets for both tanks, drilled the holes for the rivets and deburred. 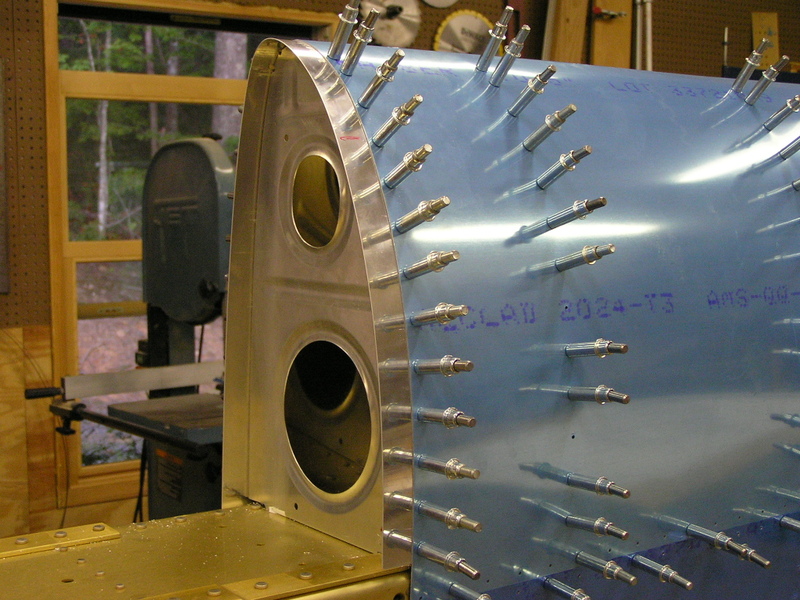 I will need to prime the outside of the tank access plate before riveting the anti-rotation bracket, installing the fuel pick-up tube and safety wiring the tube. 9/11/06 Test fit the capacitive sender plates, ran the wiring, crimped the wire nuts and final installed. I still need to apply proseal on all the connectors. 9/15/06 Drilled the anti-rotation brackets to the tank access plate and clecoed. 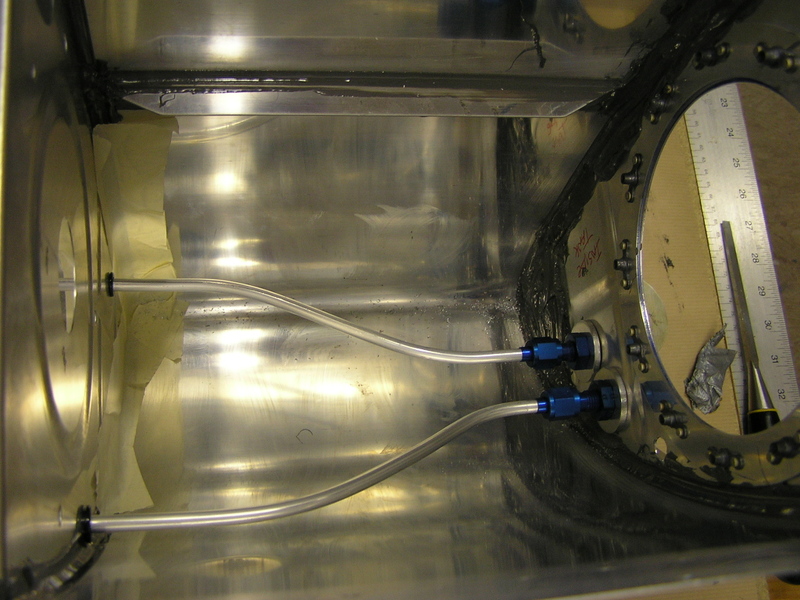 Taped the tank in preparation for prosealing the capacitive sender plates and plumbing. 9/16/06 Prosealed the electrical connections in the capacitive sender plates. 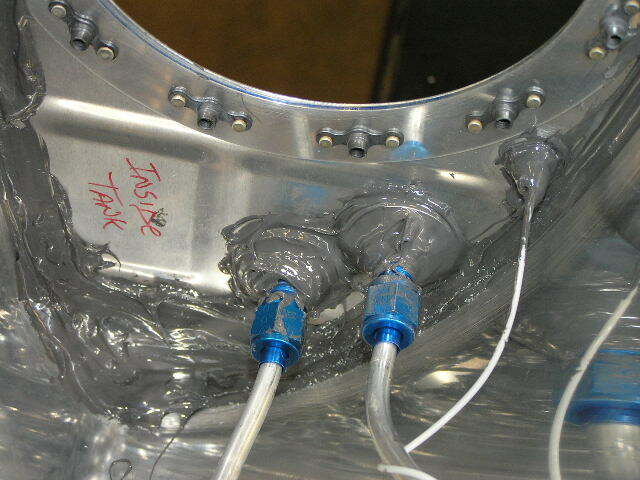 I torqued the fittings for the tank vent tube as well as the fuel/vapor return to 50 in./lbs. 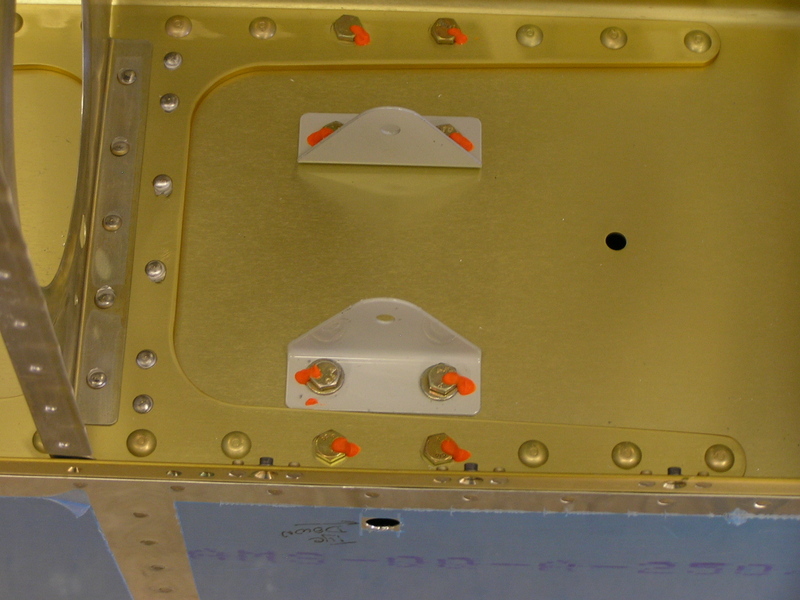 Riveted and prosealed the anti-rotation bracket to the tank access plate and prosealed. 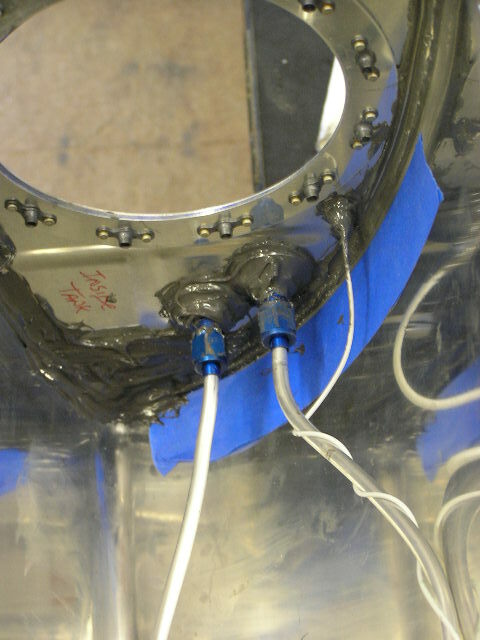 Temporarily attached fuel pickup tube. Touched up suspect areas inside the tank with proseal. 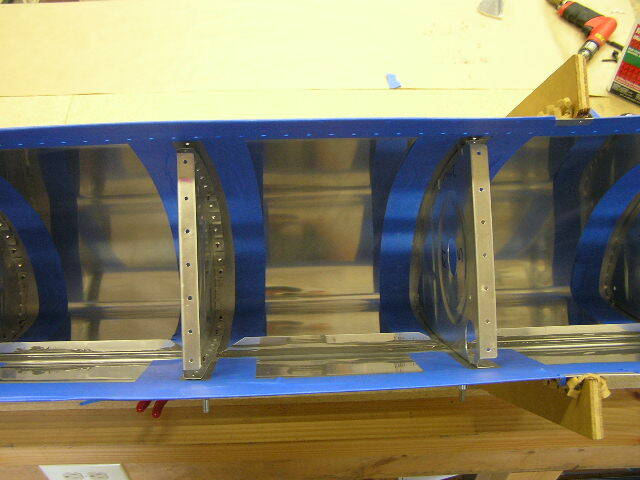 Prosealed baffle and clecoed. 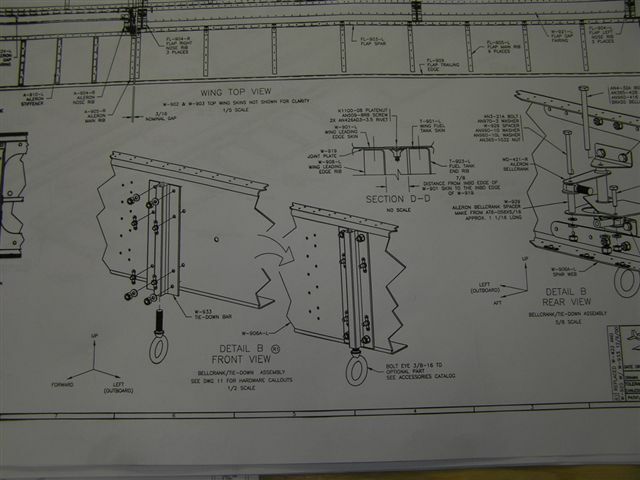 Riveted baffle attach brackets. 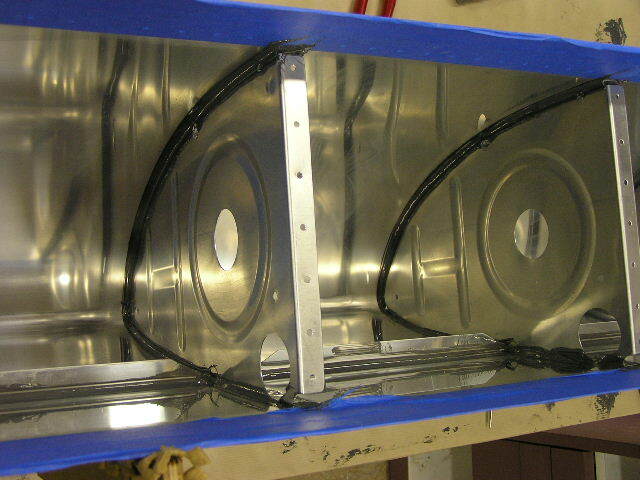 Riveted the skin to the baffle. Riveting the baffle took over two hours! I'm about ready to be done with this tank. 9/17/06 I torqued the fuel pick-up tube nut to 110 in. lbs. 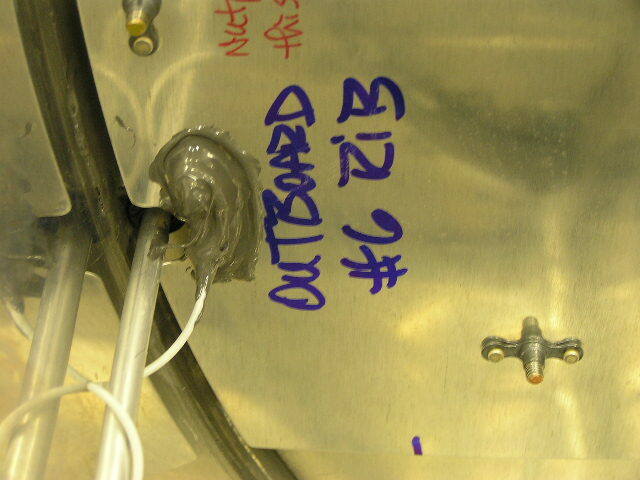 and safety wired the nut for the fuel sender per the Safety Bulletin. 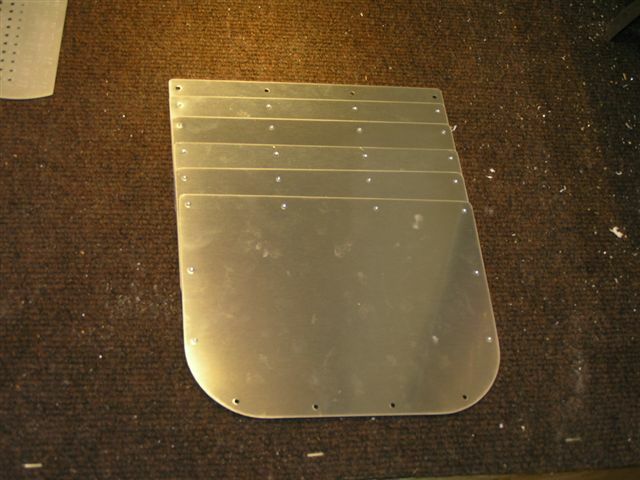 Prosealed the tank access cover plate. I omitted the cork gasket per the recommendations of several other builders. 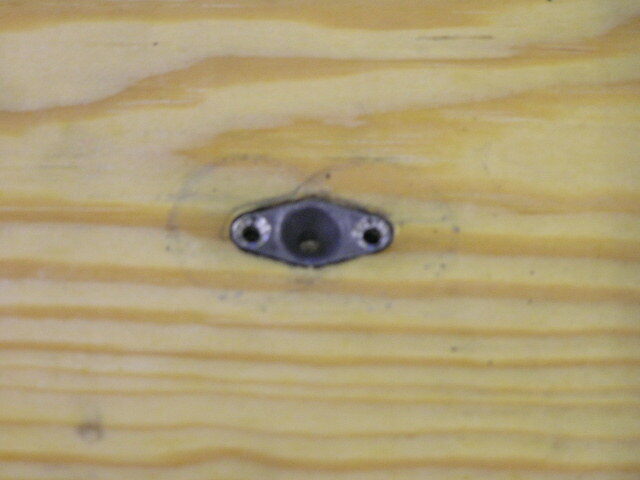 I swirled each screw in proseal before installing and alternately tightened each screw. I like the nice uniform squeeze-out around the plate. 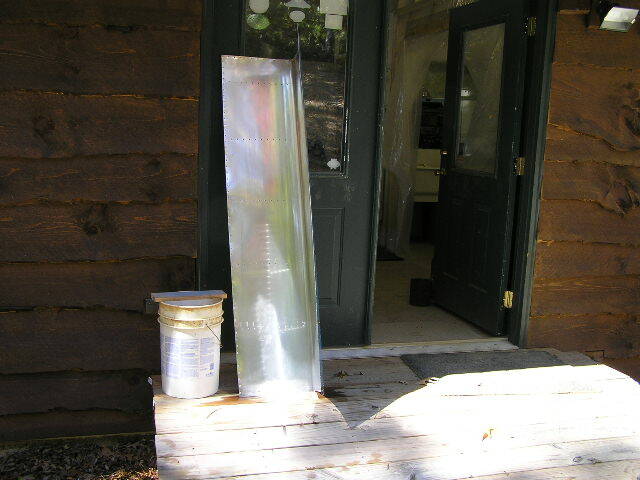 I had just enough proseal remaining in the quart can to complete the tank. 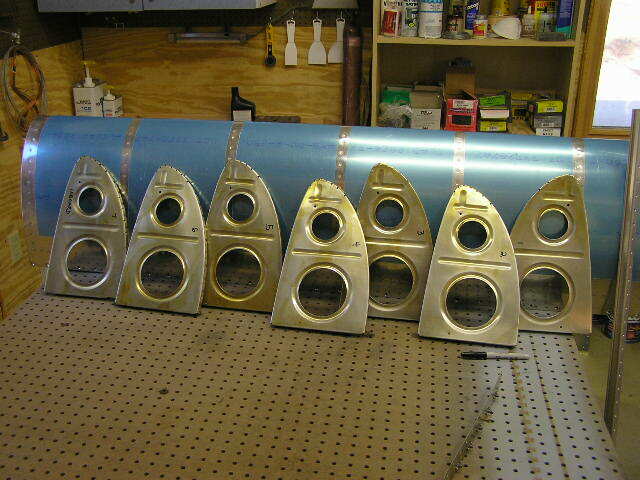 9/23/06 Dimpled the inboard and outboard bottom skins. 9/24/06 Dimpled the splice plate. Dimpled skin and ribs and set aside for chemical priming. 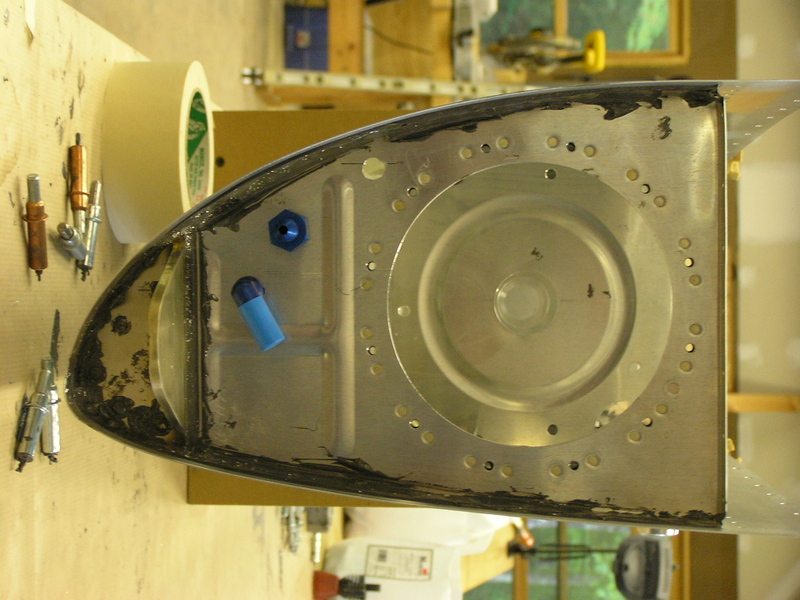 Removed the top outboard skin and removed the plastic along the rivet lines. Deburred the outside skin. 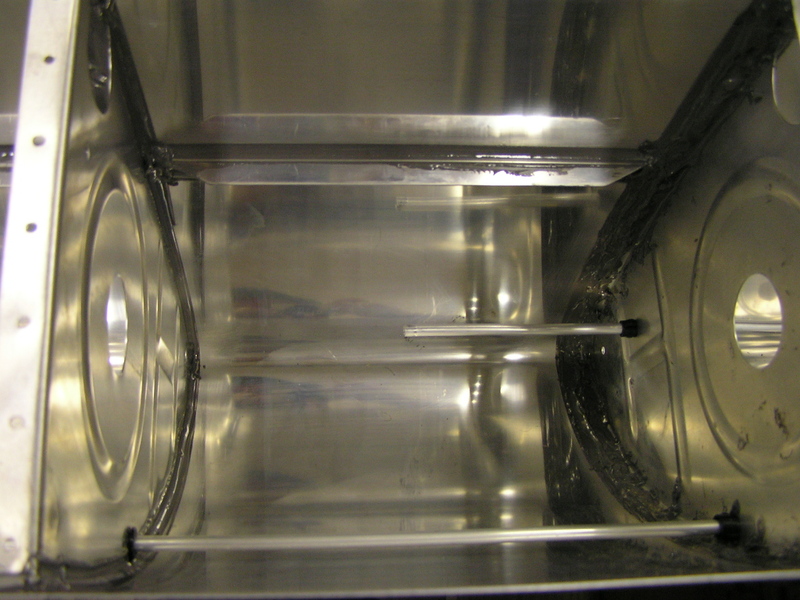 Removed the inside plastic coating and deburred. Again, used the die grinder with a 2" scotchbrite deburring wheel to grind the corner where the outboard skin overlaps the inboard skin. 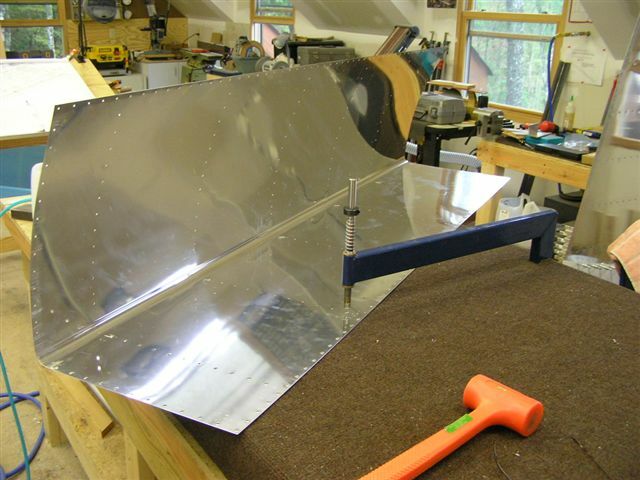 10/6/06 Dimpled the wing walk doubler and deburred the outer edges. Deburred and dimpled the inboard top skin. Ground the corner where it is overlapped by the outboard skin at the junction with the leading edge. Deburred the outer edges. 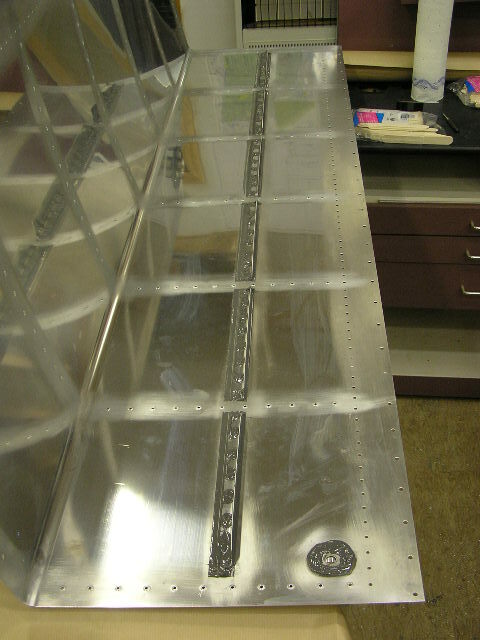 Deburred the main wing ribs and then dimpled. Used the deburring tool to ream the dimples in the rear spar (top and bottom). 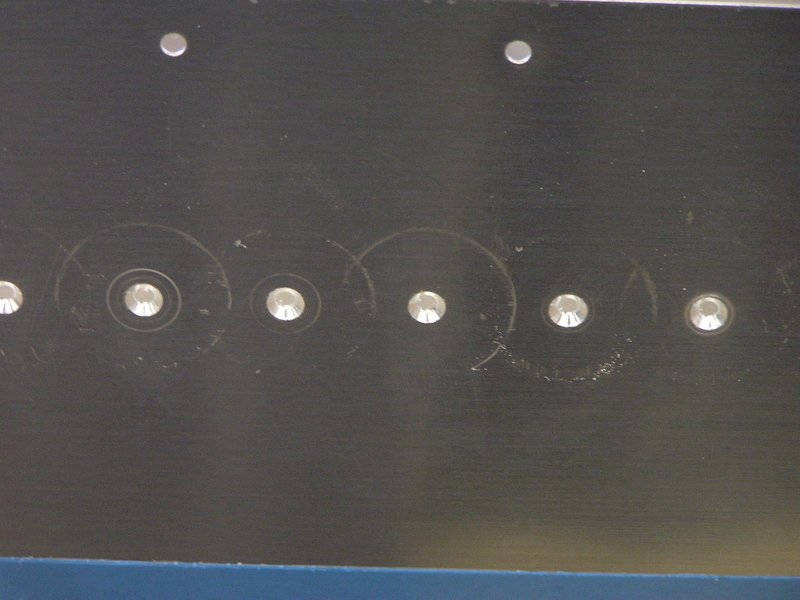 Drilled the #8 screw holes in the tank splice plate to full size with a #19 drill bit. Deburred and dimpled. 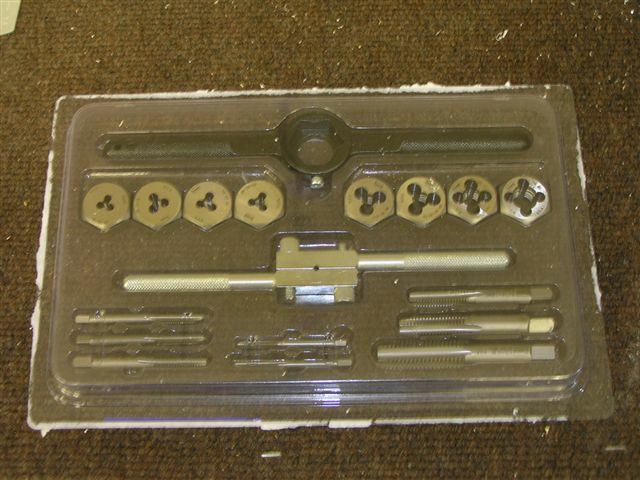 Clecoed the K-1100 platenuts and drilled the attachments to #40. Deburred and dimpled. Countersunk the platenuts. 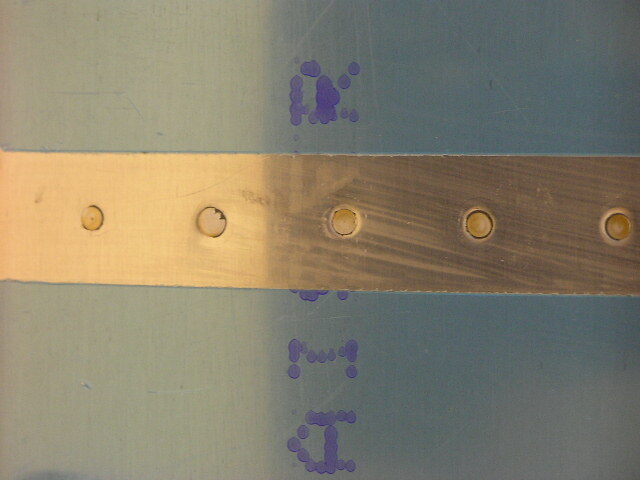 Set splice plate aside for conversion coating. 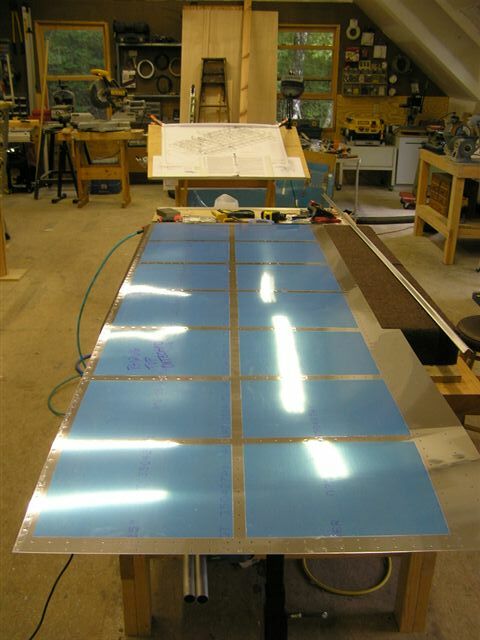 Began countersinking the #40 holes in the spar. I checked the depth occasionally using a dimple test set. 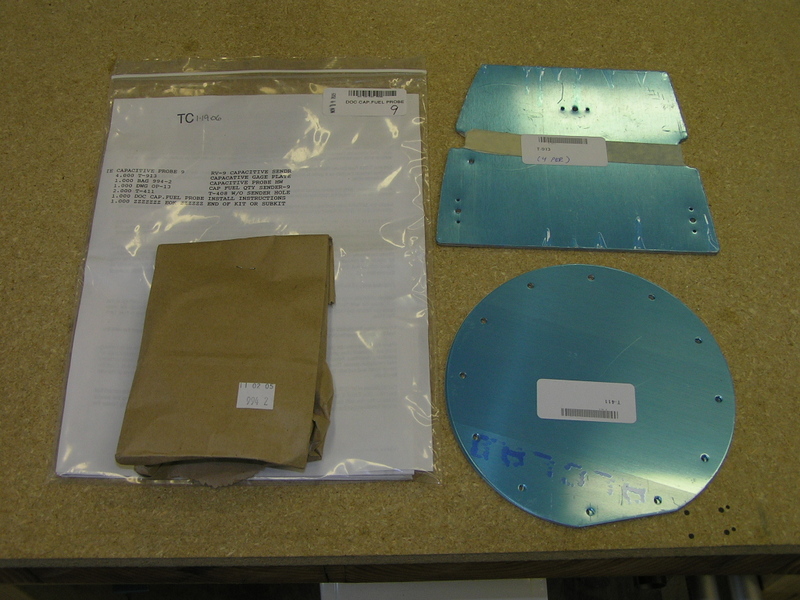 .035 for inboard skin and .025 for outboard skin. 10/7/06 Today was an absolutely breathtakingly beautiful day so I set up some sawhorses outside the shop to chemically treat the skins and ribs, etc. 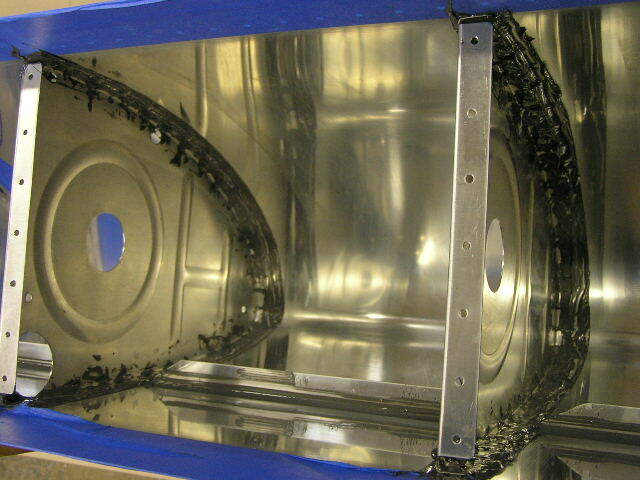 This is a tedious task that involves cleaning the part with MEK, chemical cleaning and finally chemical conversion coating. 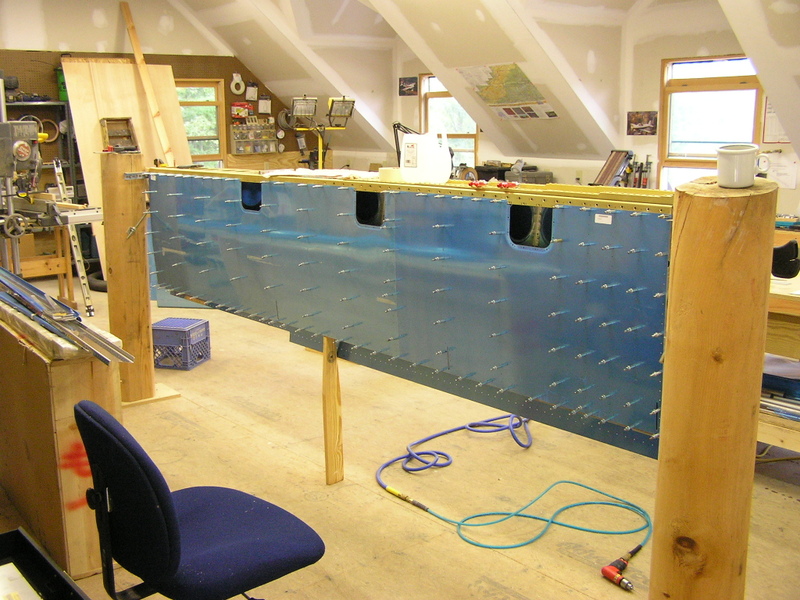 I treated the inboard and outboard top skins, the outboard leading edge skin and ribs, the wing walk doubler and the inboard and outboard J- stringers. Here you can see the ribs before and after. 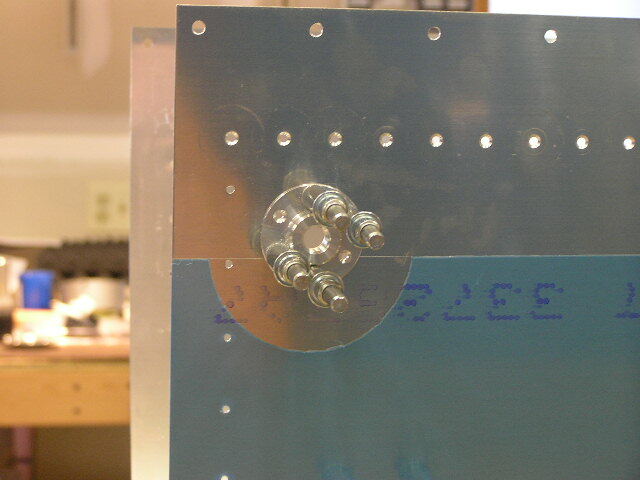 I riveted the platenuts to the tank splice plate. I used the deburring tool to ream out the dimples in the splice plate in order to help make the leading edge skin, splice plate and inboard end rib fit together as tightly as possible. 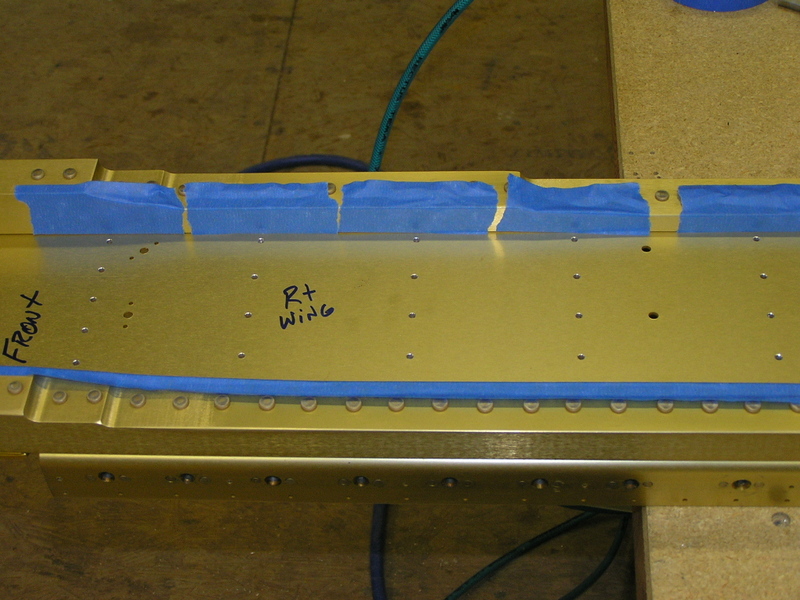 Placed the leading edge skin in the cradle and clecoed the splice plate. 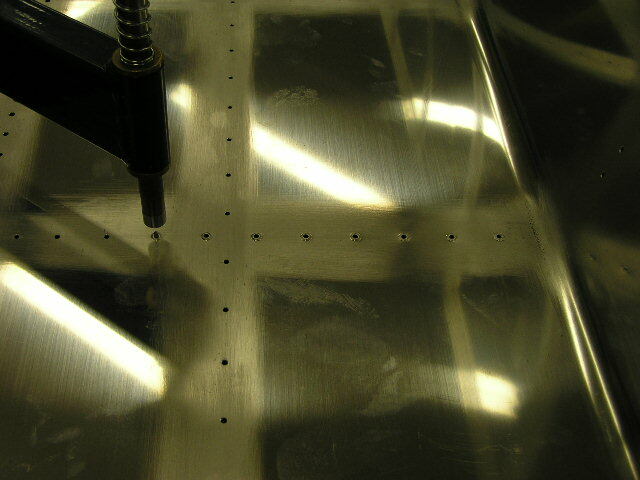 Finished countersinking the rivet holes on the top spar flange. 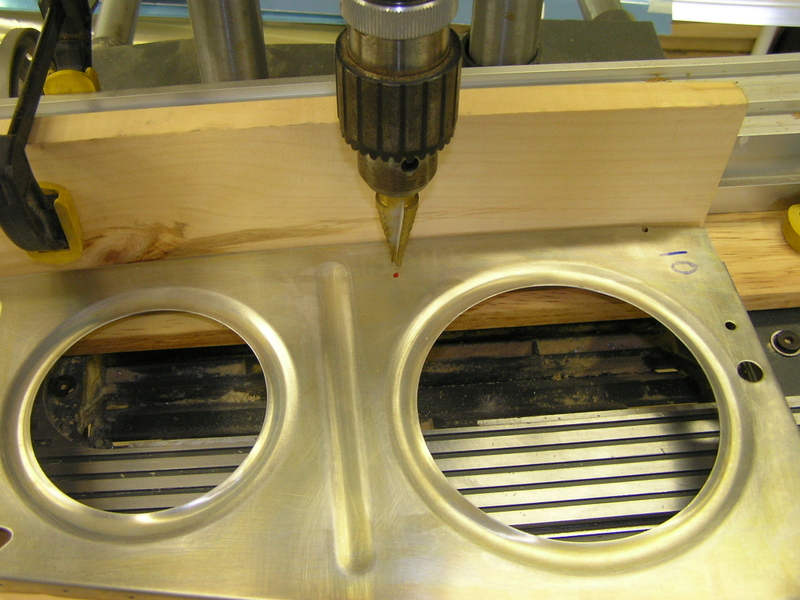 I finished countersinking the rivet holes in the spar flange and used a q-tip to dab alodine in each countersink. This was tedious and time consuming and I could have just taped the spar off and shot with rattle-can primer but decided my wings are going to be "primer-free". Besides, alodine offers much better protection. 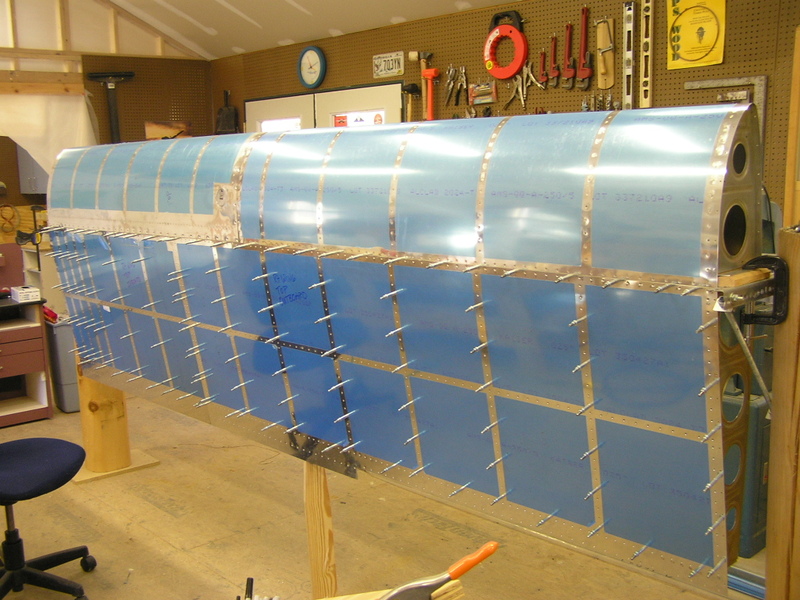 With this accomplished, it is now time to start riveting this wing together! 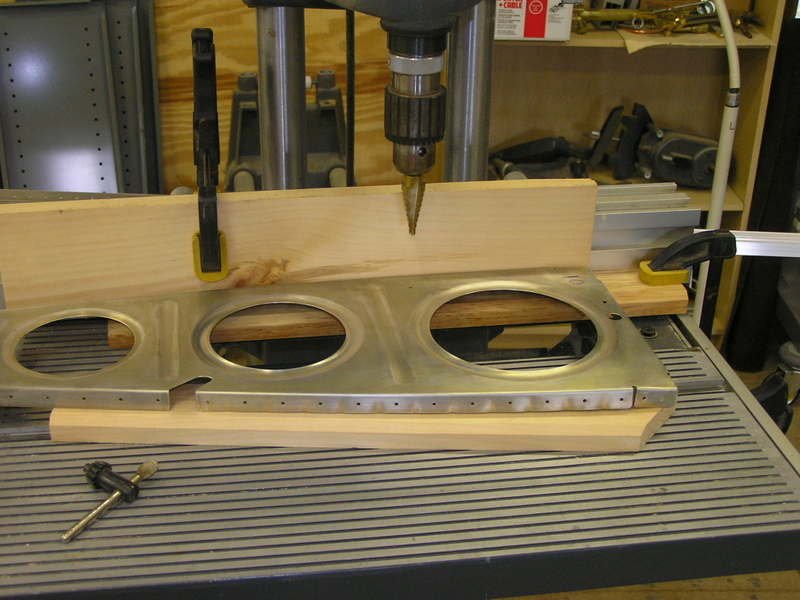 I started on the leading edge by using the pneumatic squeezer to squeeze the aft two rivets on each rib top and bottom. 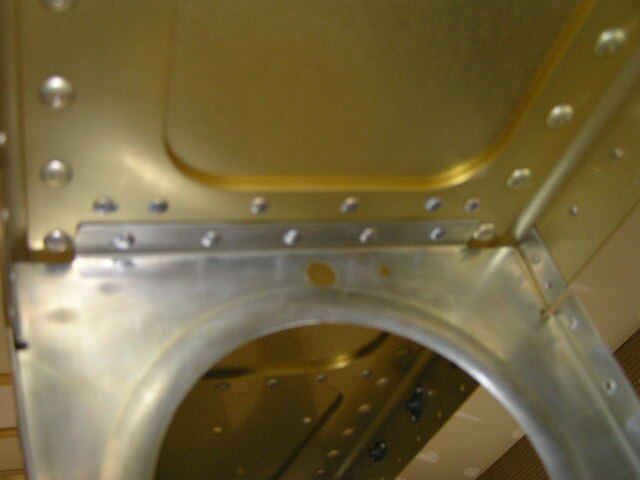 I then switched to the rivet gun and drove a rivet in each rib on top and then on bottom. This "going round and round is really slow but that's how the plans say to do it. 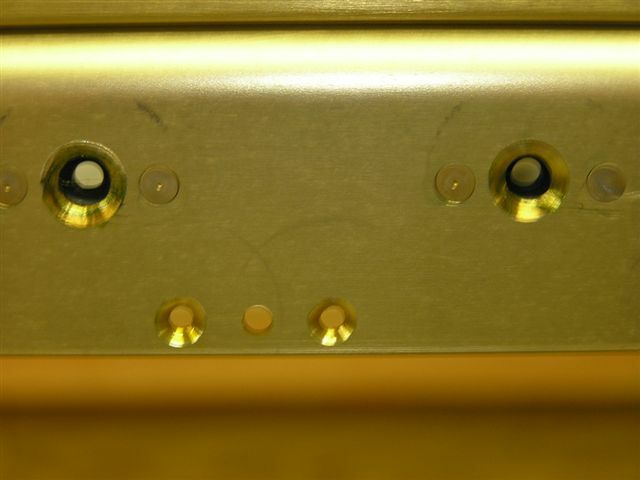 TIP: I found that the -4 rivets called out for the inboard rib (and splice plate) were a little too short so I substituted -4.5 rivets and they worked great. I got about 3/4ths of the rivets driven. 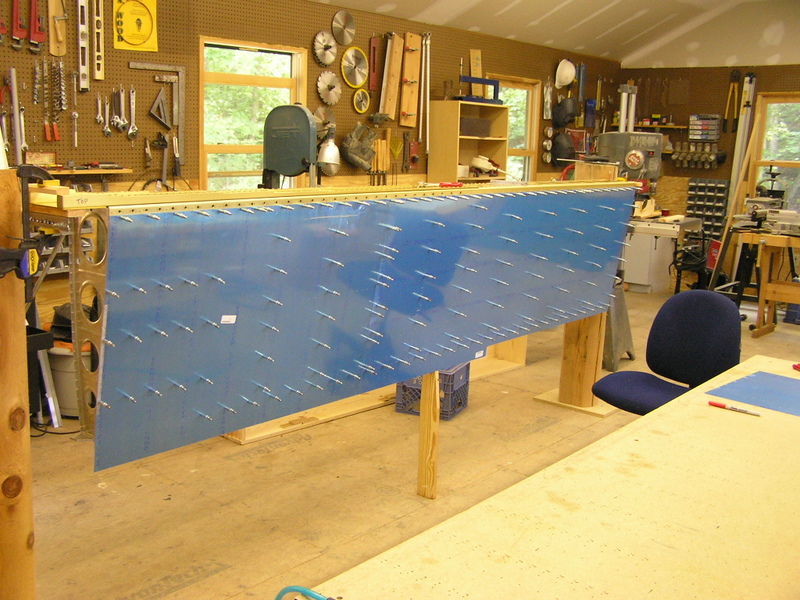 10/11/06 Finished riveting the leading edge and clecoed it to the spar. 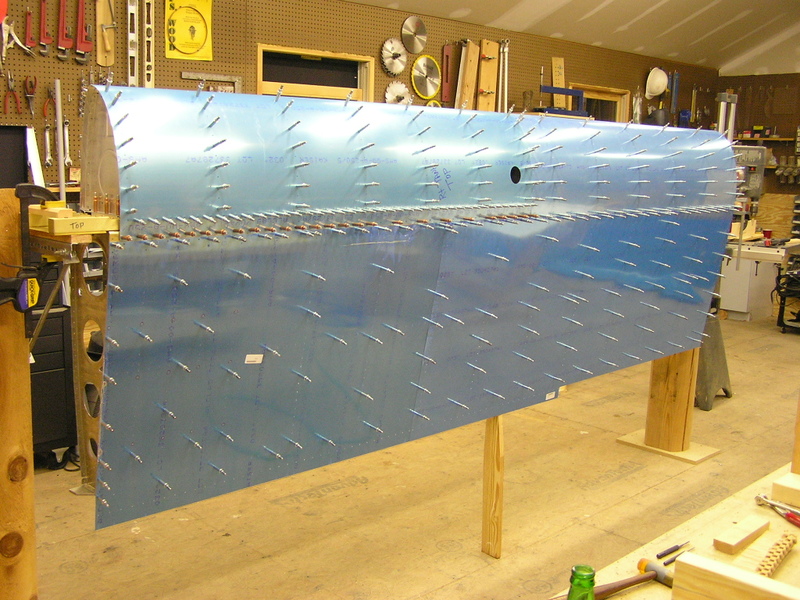 10/12/06 Began riveting the leading edge ribs to the spar. 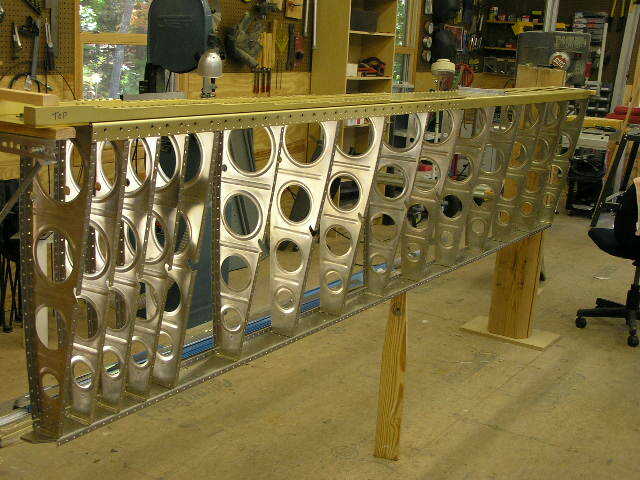 10/13/06 Continued riveting the leading edge ribs to the spar that I could reach by myself. 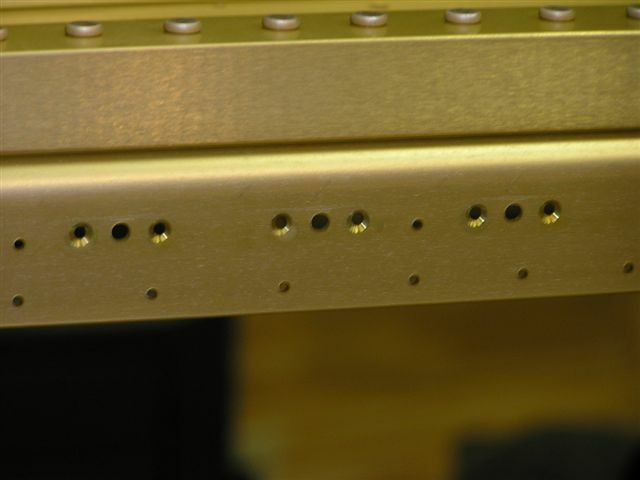 There is still one bay yet to rivet so I went ahead and squeezed the rivets along the top and bottom spar. I drilled out the hole over the tie-down bracket to full size. 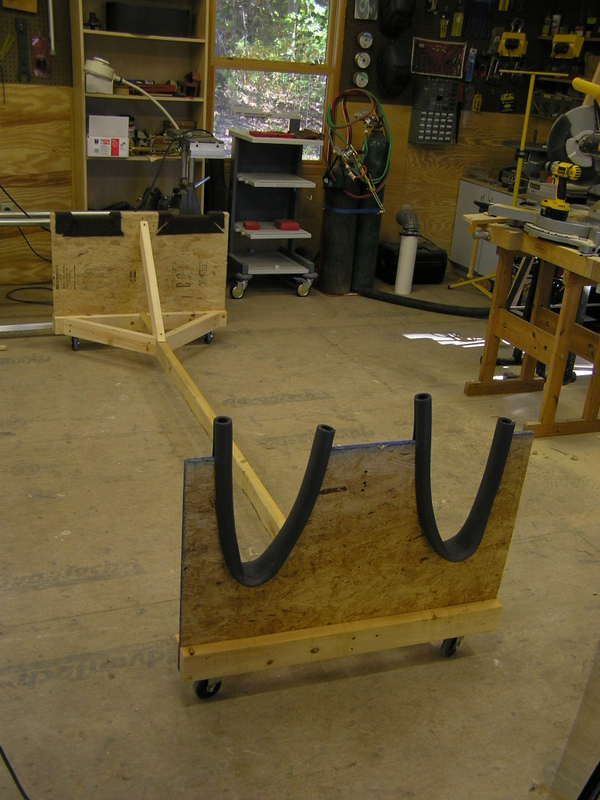 10/15/06 I built the wing cradle per Van's plans. 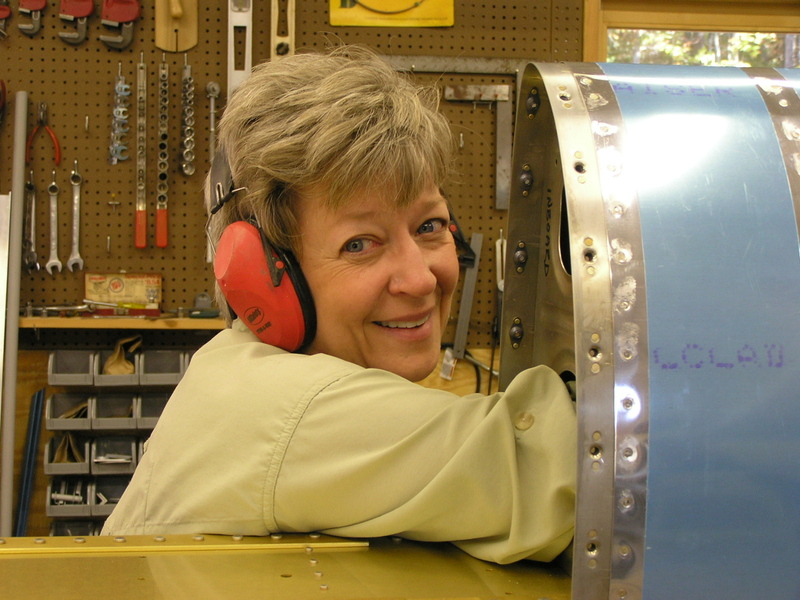 I got Lynne out to help me buck the last 5 rivets in the interior of the leading edge. She has nice skinny arms. 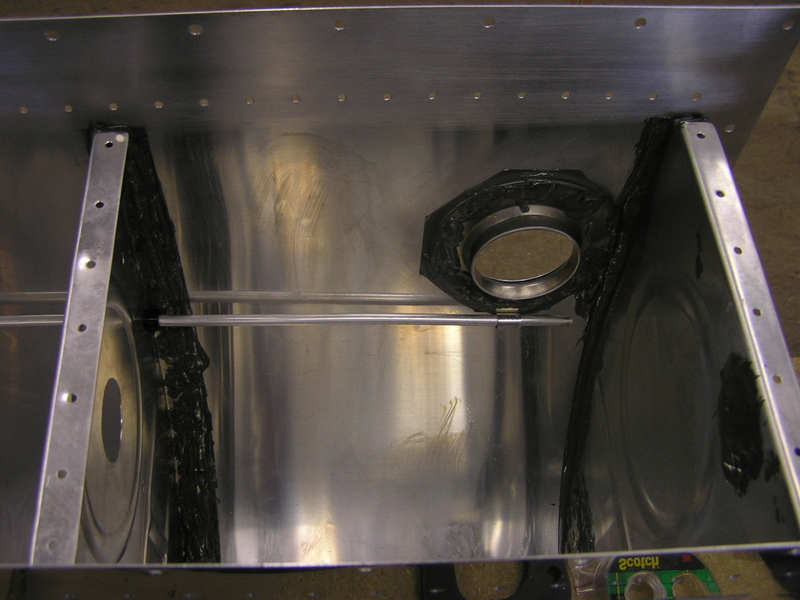 With this completed I was able to install the fuel tank and torque the bolts through the spar as well as install the screws in the top and bottom skin. 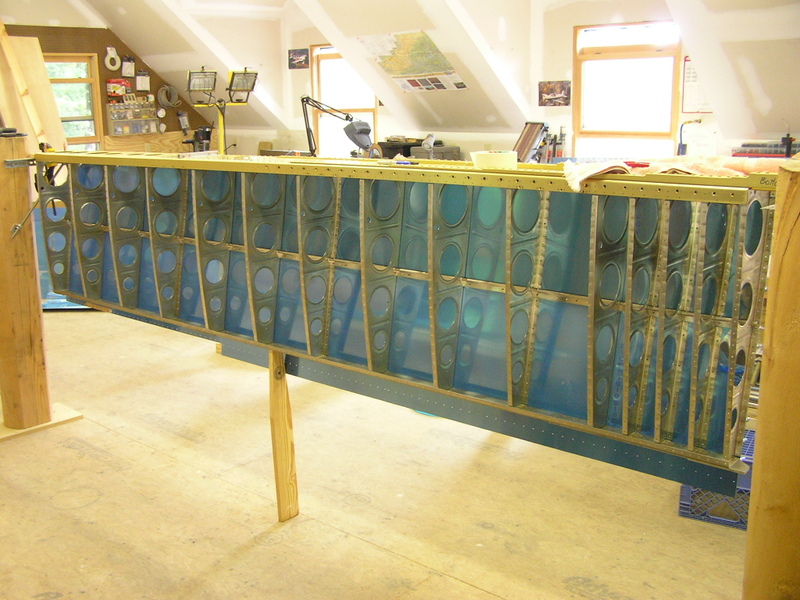 I then clecoed the top skins to the wing. 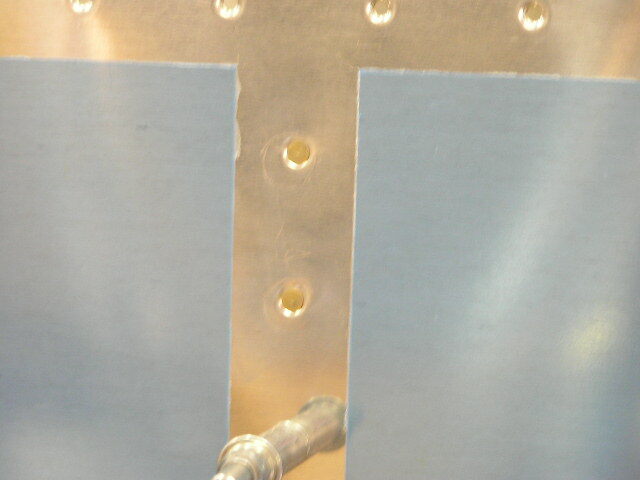 Fellow EAAer Jim Olson came by and helped me rivet the top skin. 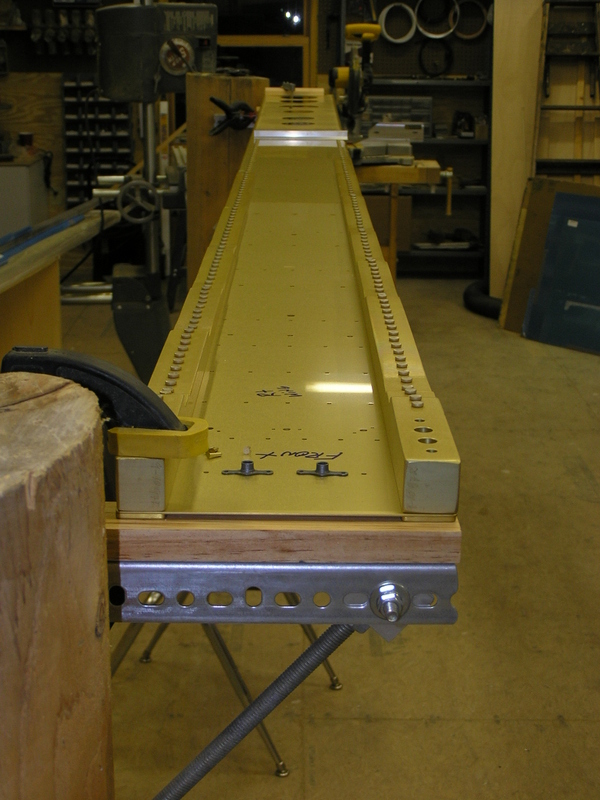 We then took the wing off the stand and placed it in the new wing cradle. Thanks Jim. 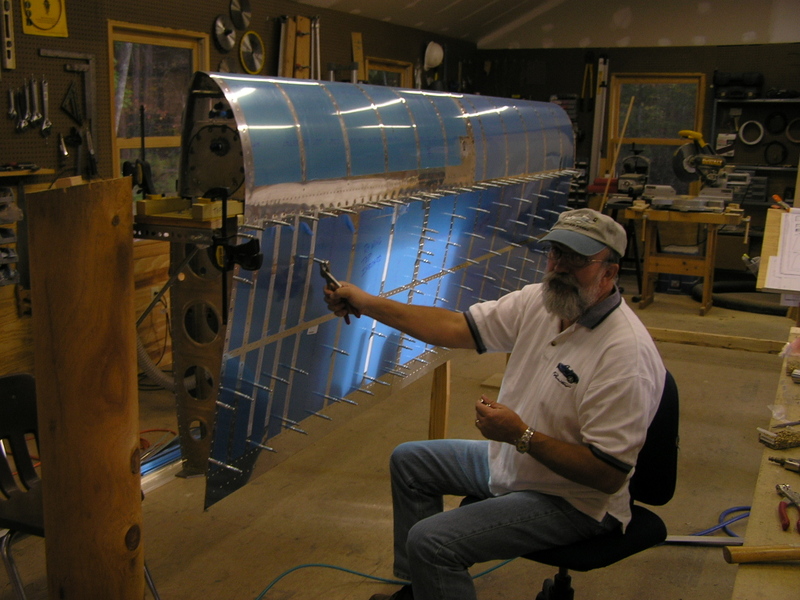 10/17/06 Another EAA friend, Anton D'Allen came over tonight and helped me rivet the top skin the the rear spar. 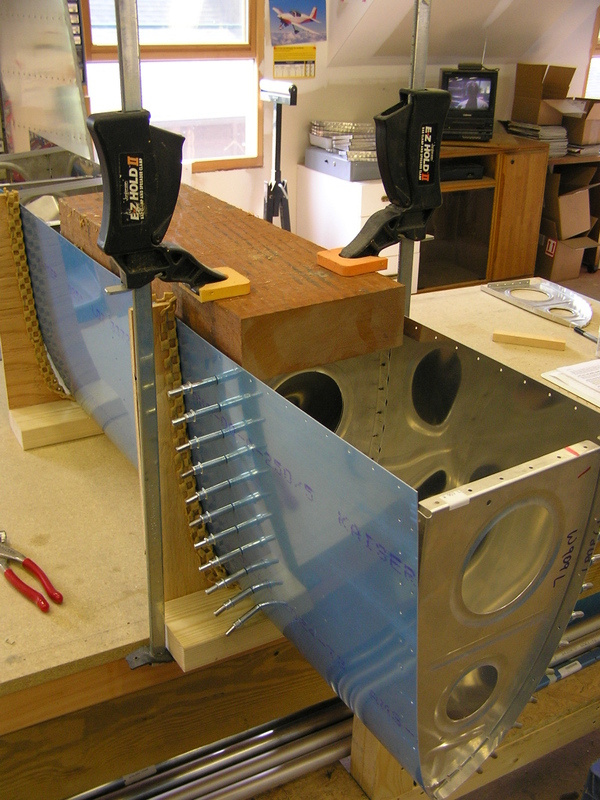 I also began working on the aileron attach brackets. I deburred the brackets and clecoed the assembled brackets to the rear spar. 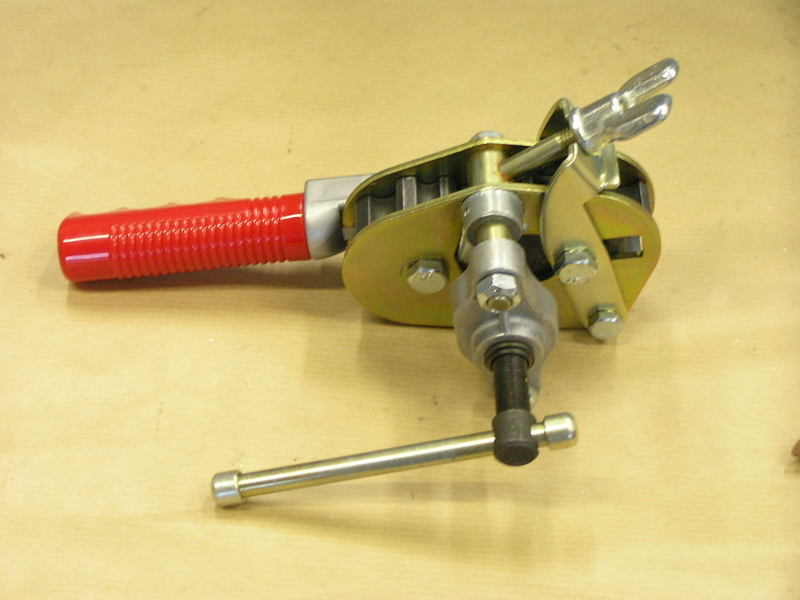 I applied torque seal to the bolts attaching the fuel tank and the bellcrank brackets. 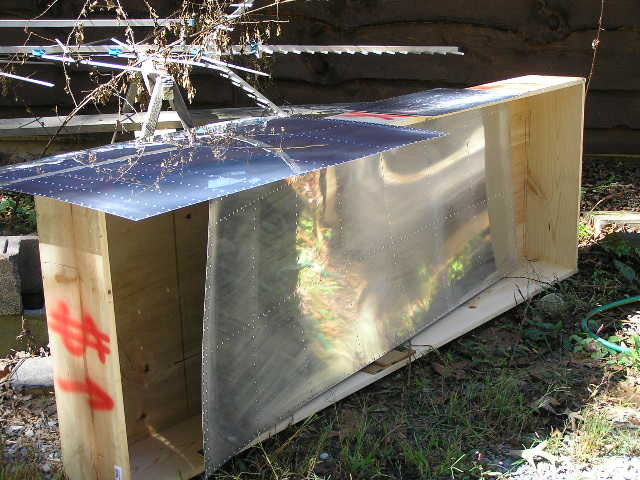 10/18/06 Today I received my Bob Archer wingtip antennas. I am planning on putting the NAV antenna in the top of the right wingtip, the Marker Beacon antenna in the bottom of the right wingtip and the #2 COM antenna in the left wingtip.